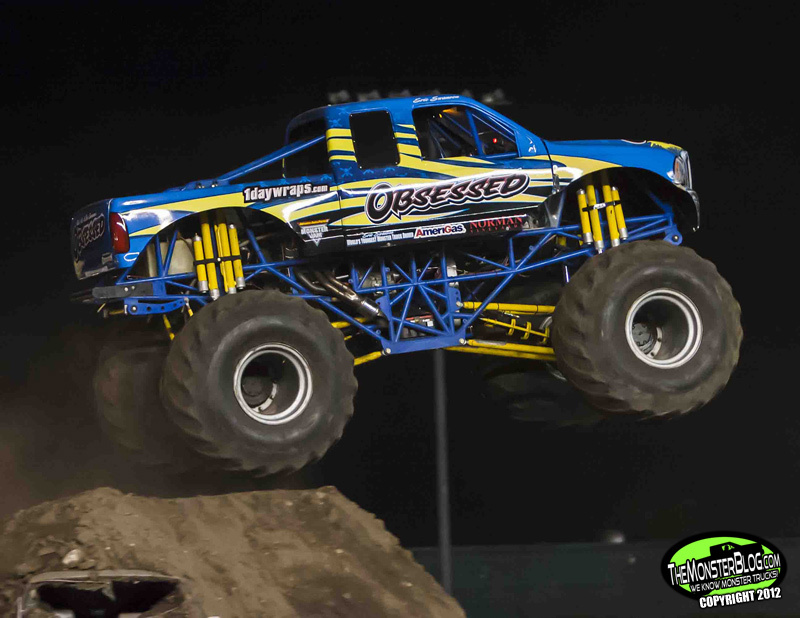 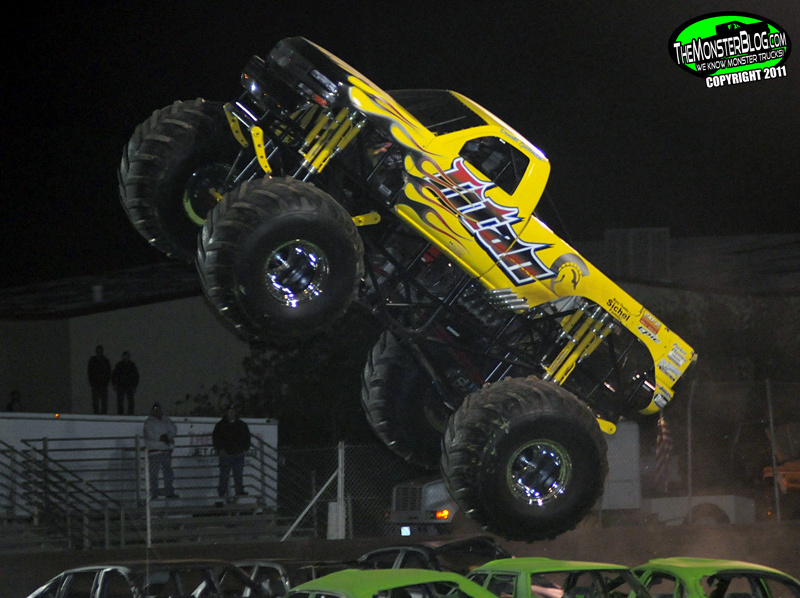 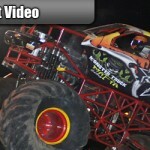 The Monster X Tour invaded Chico, California this past weekend and TheMonsterBlog.com was on hand for all the action, the tour’s and our first outdoor event of 2011. 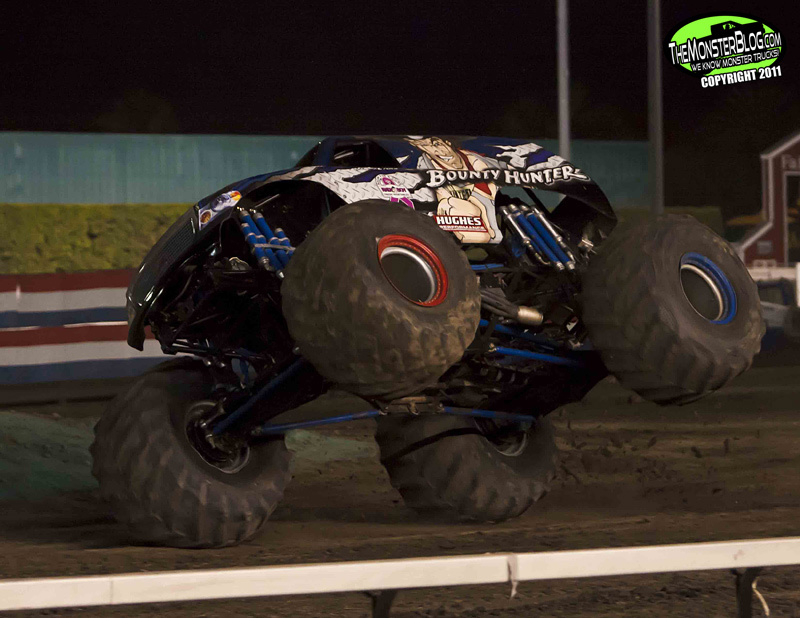 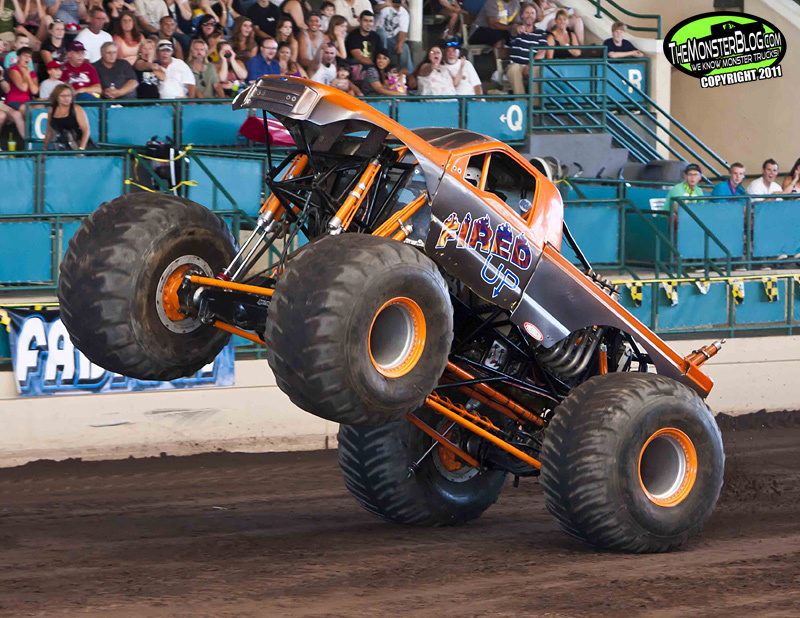 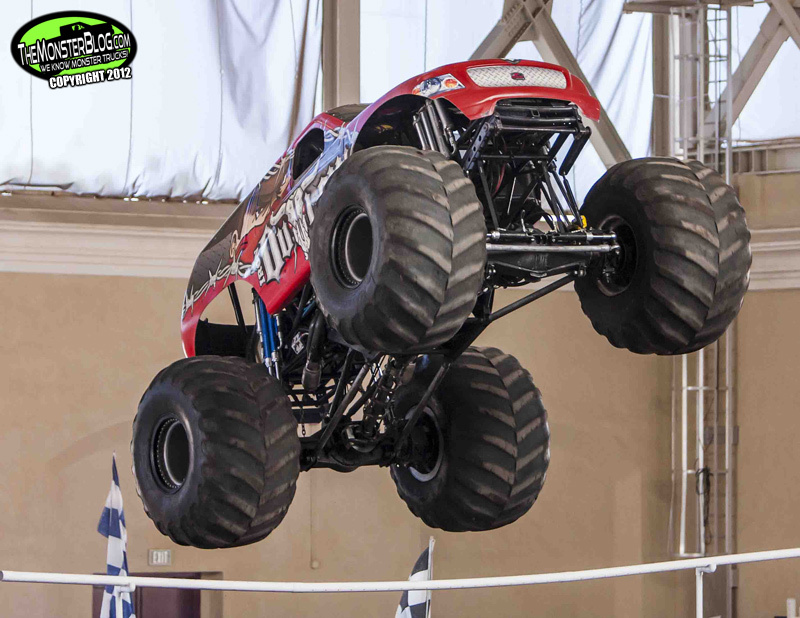 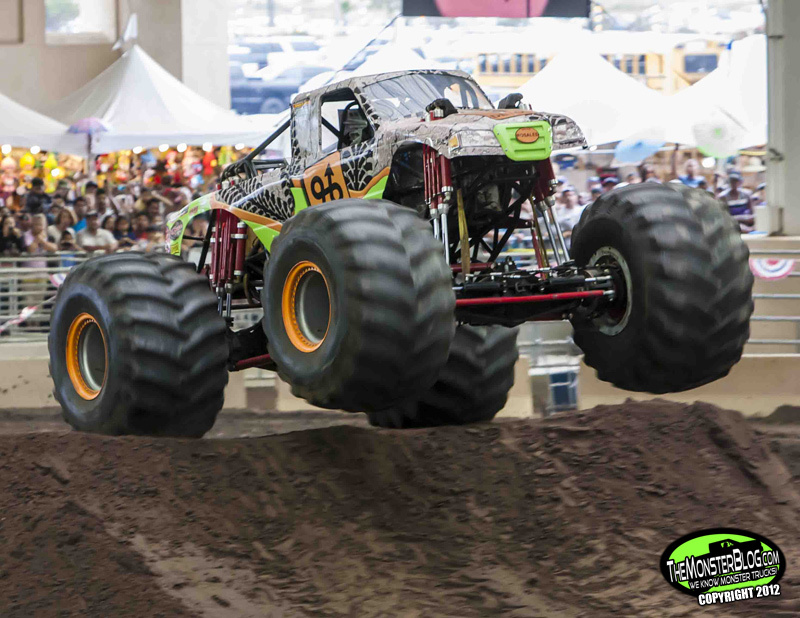 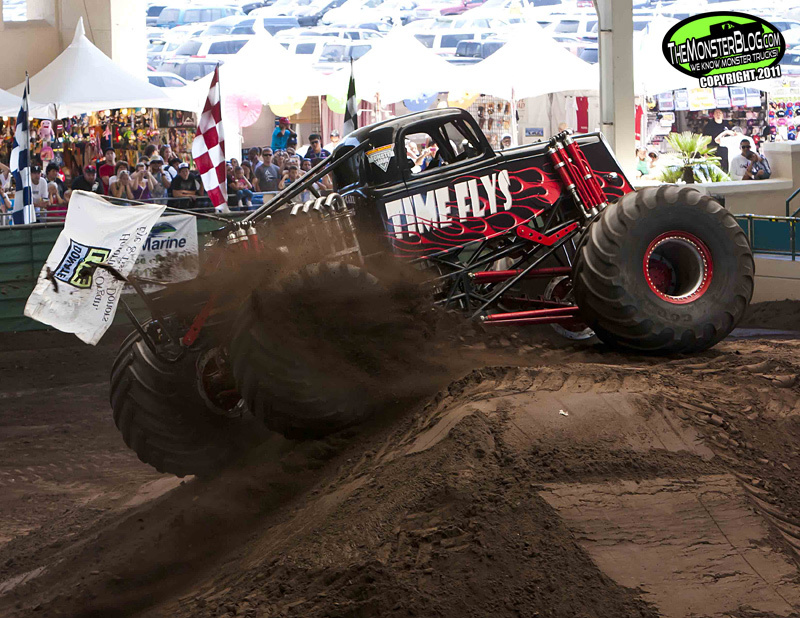 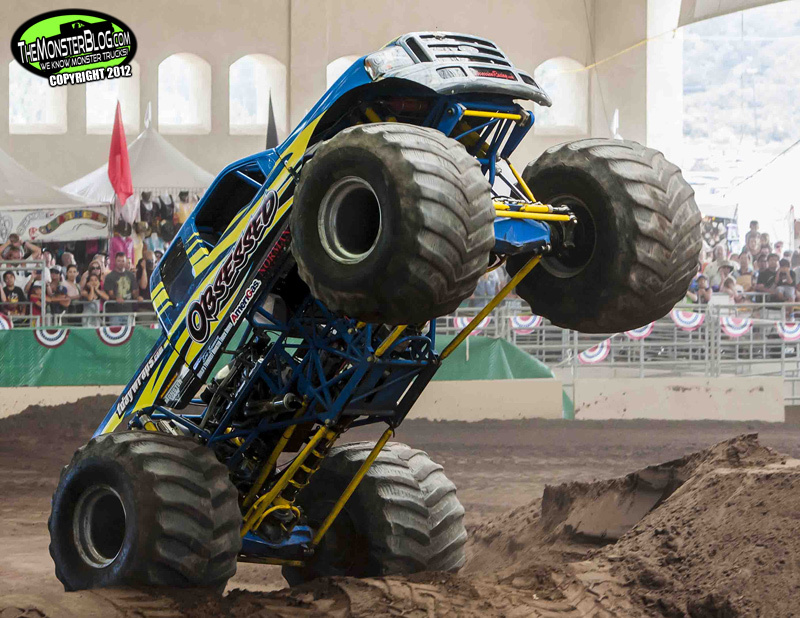 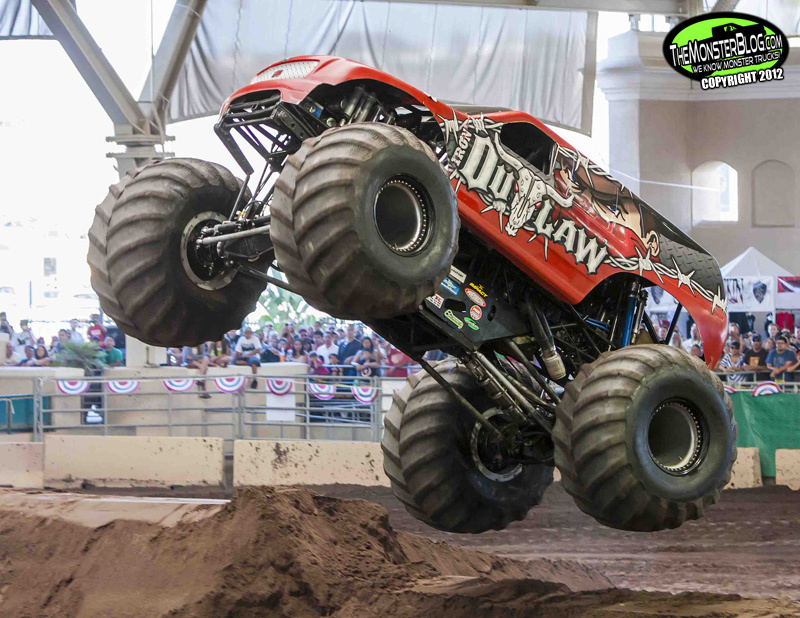 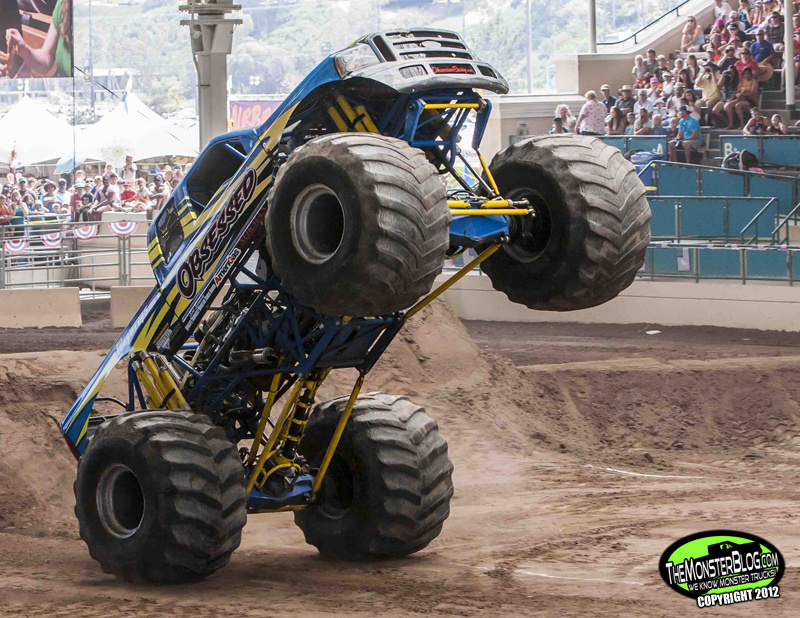 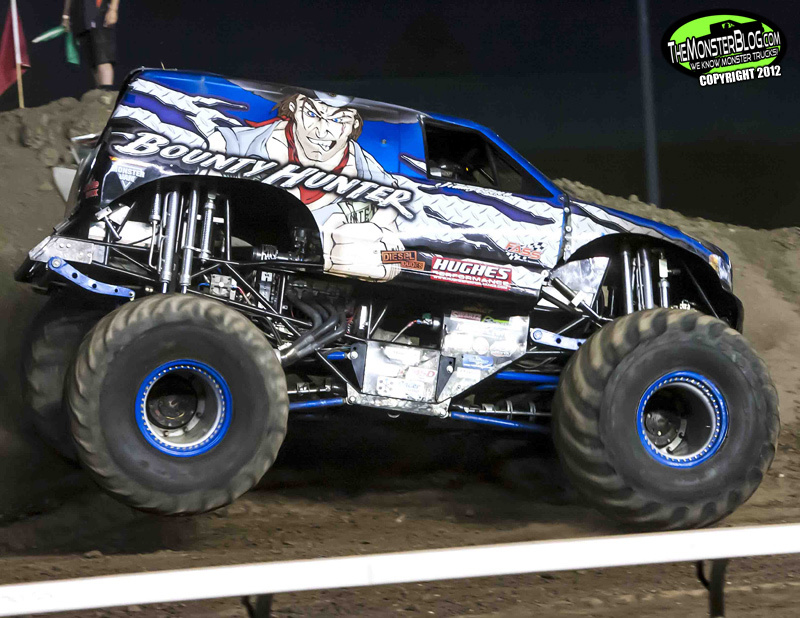 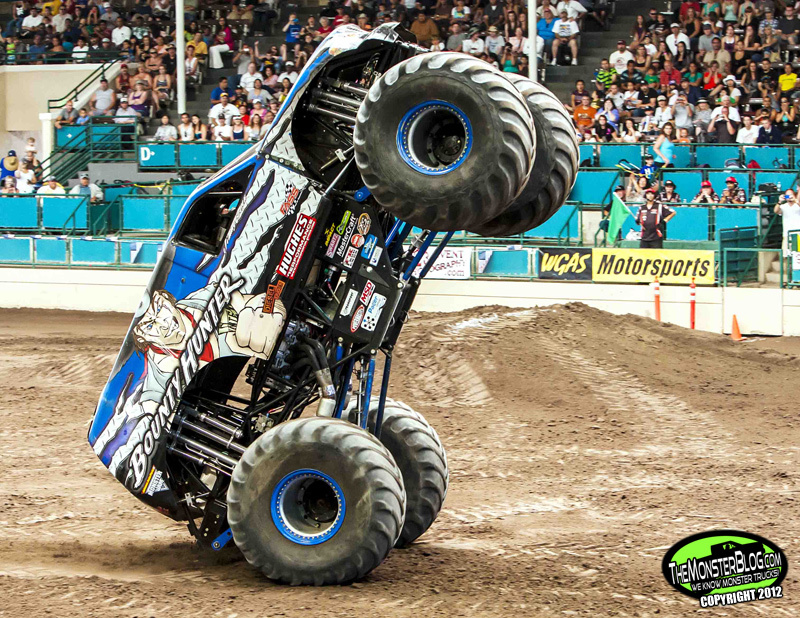 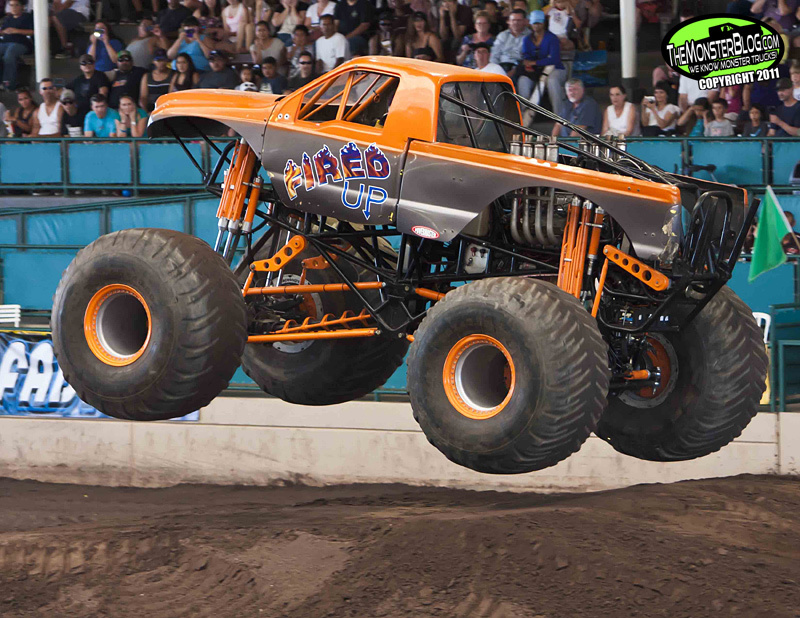 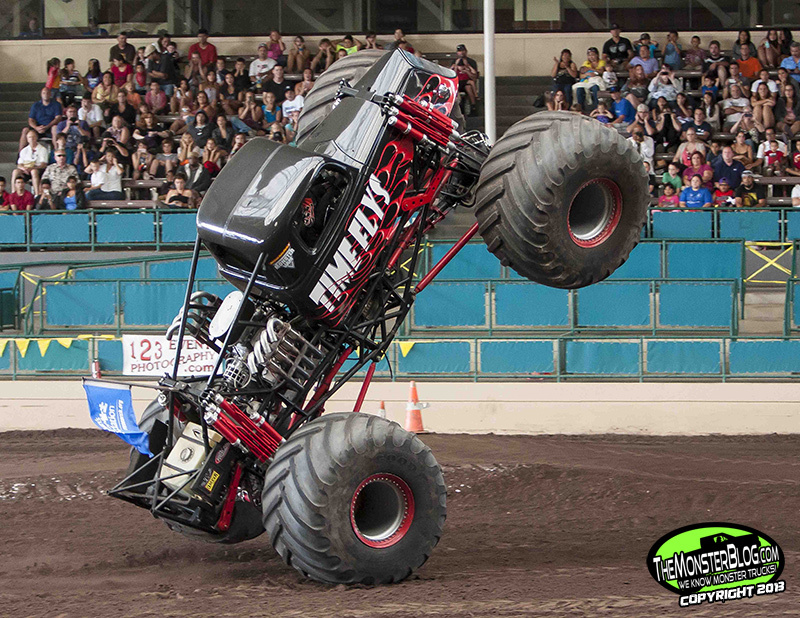 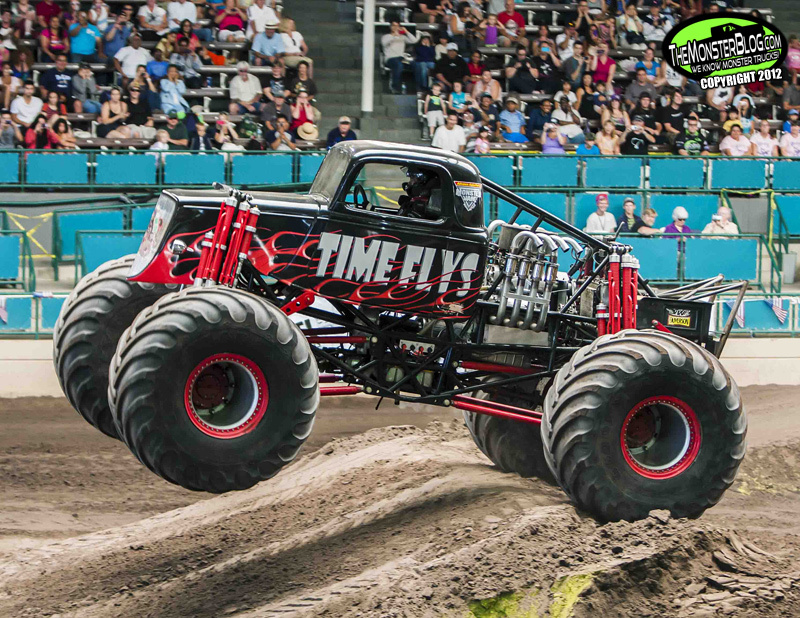 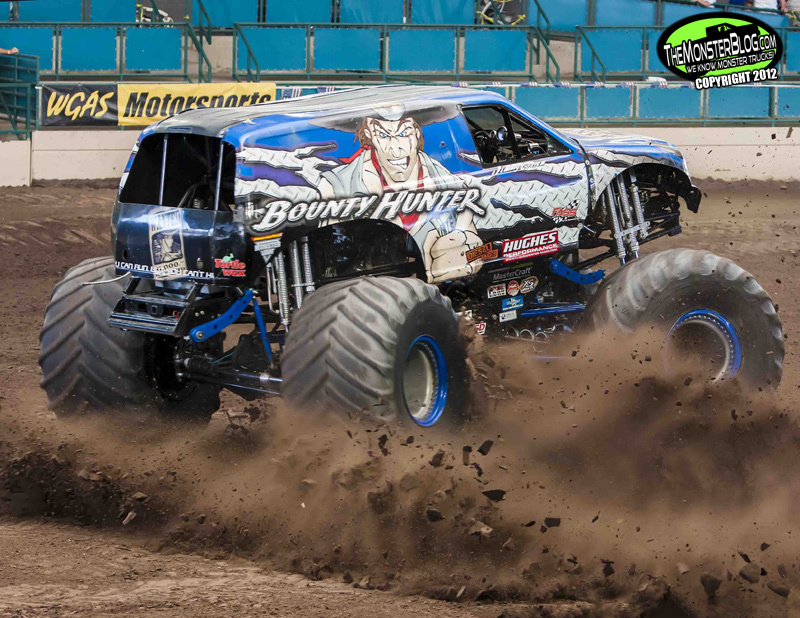 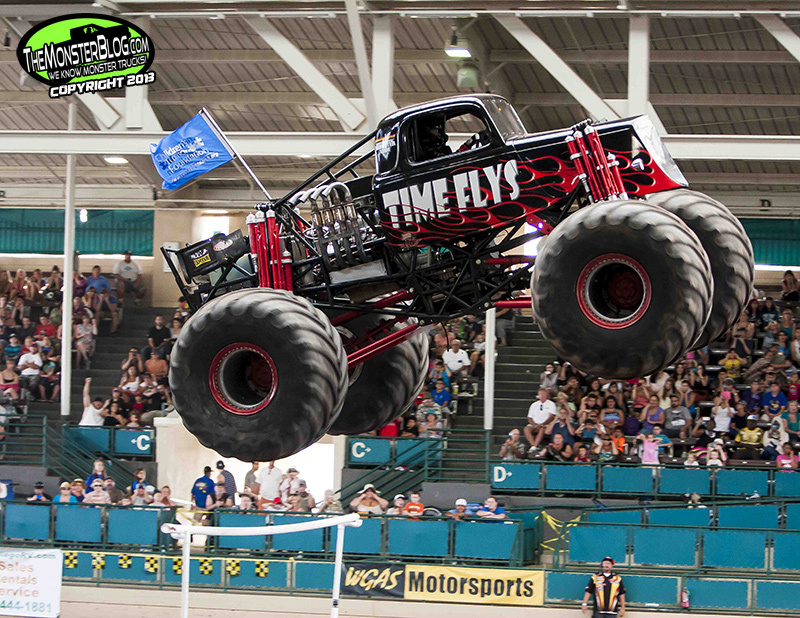 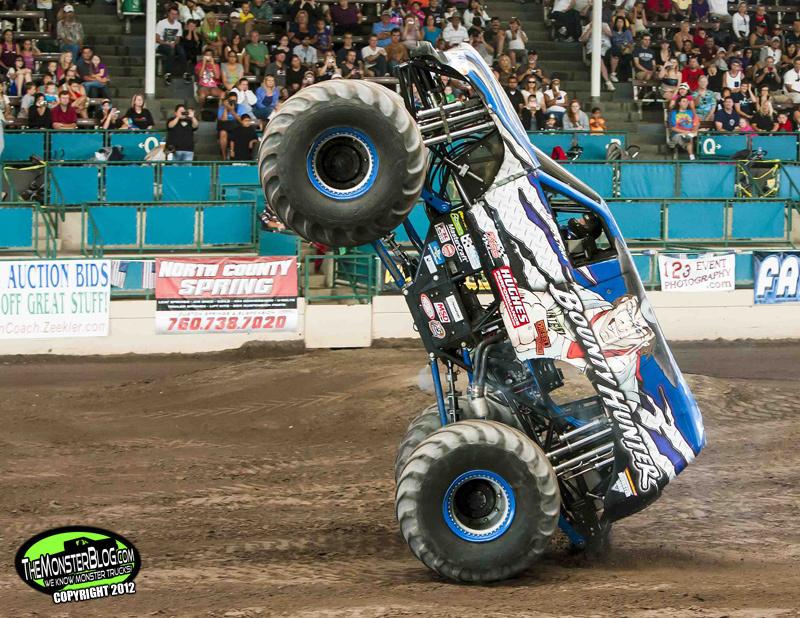 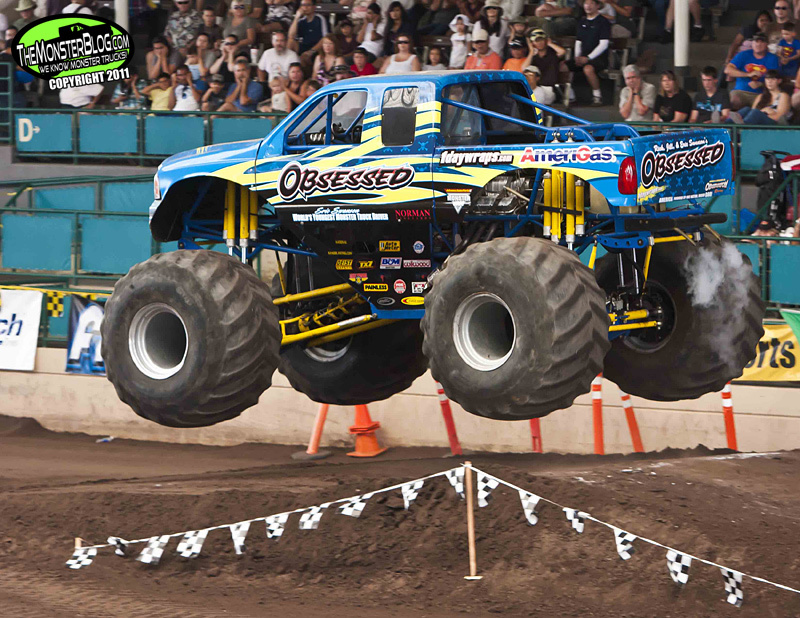 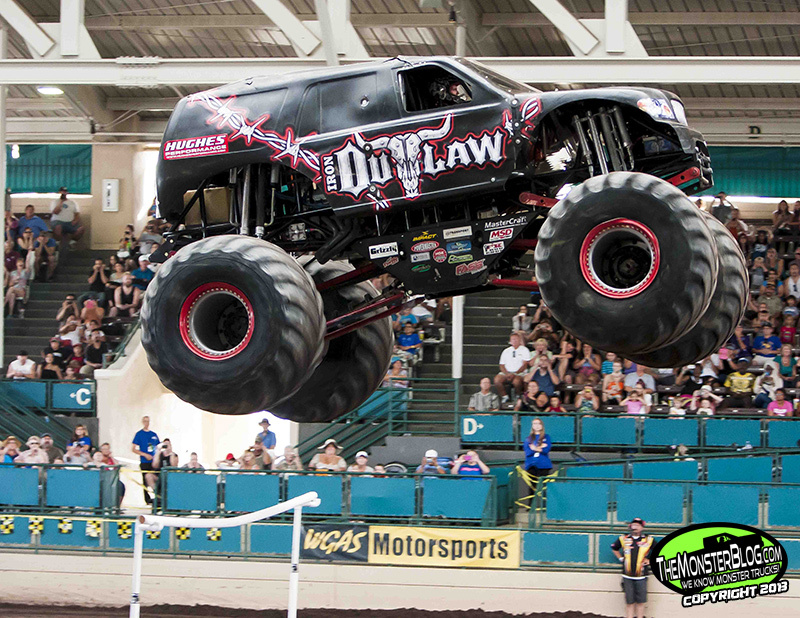 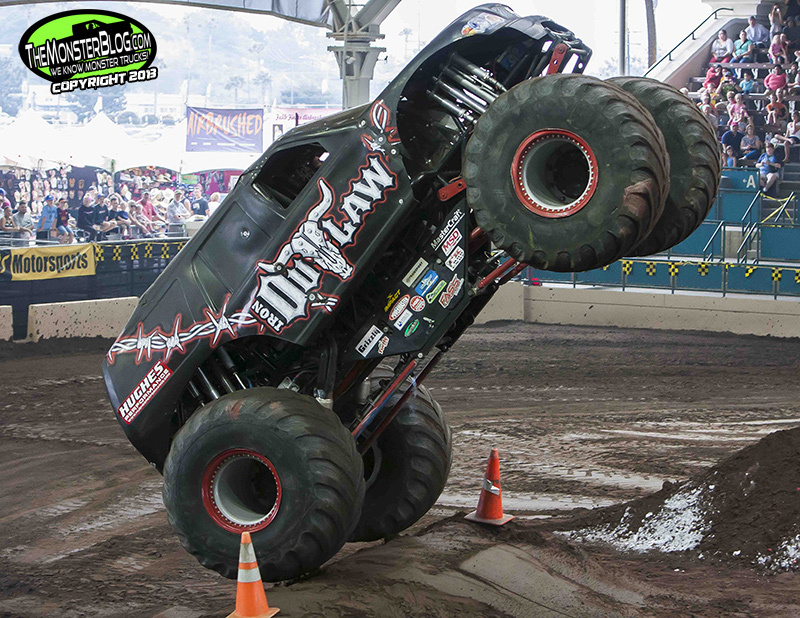 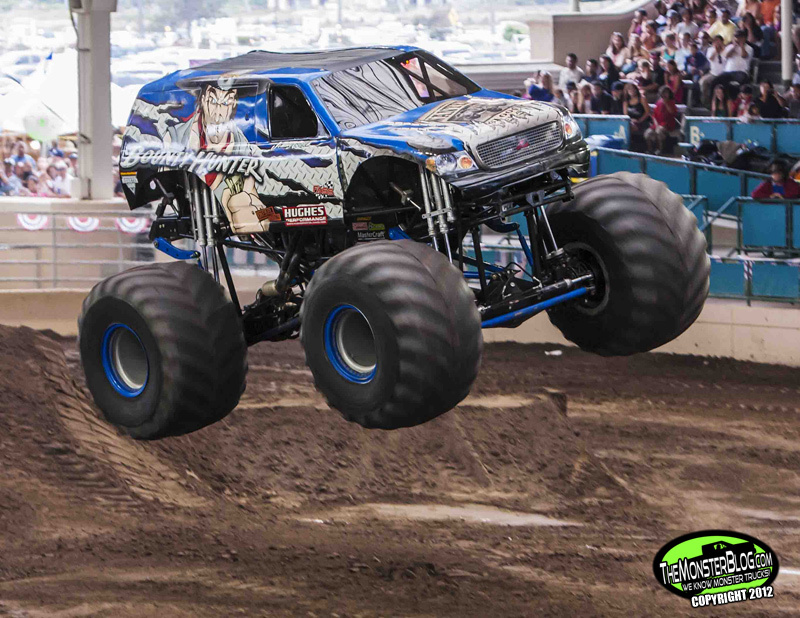 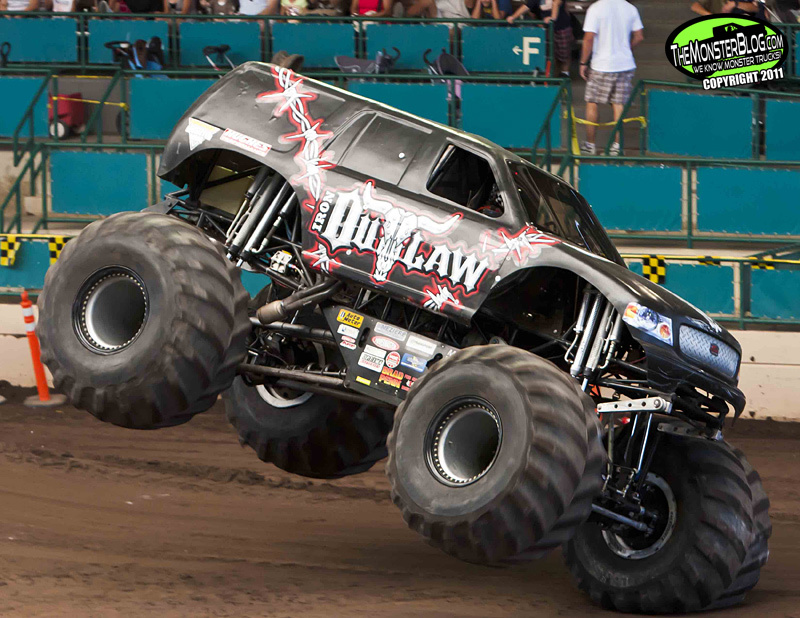 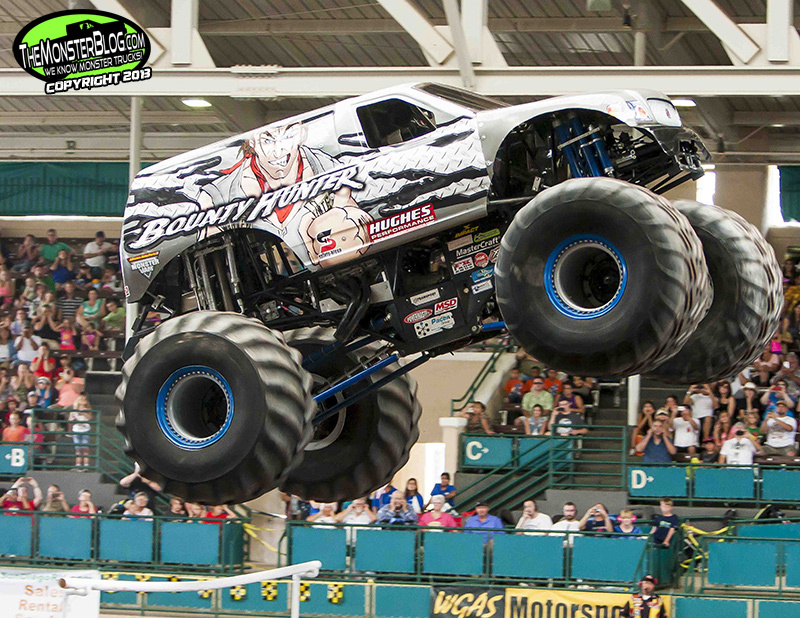 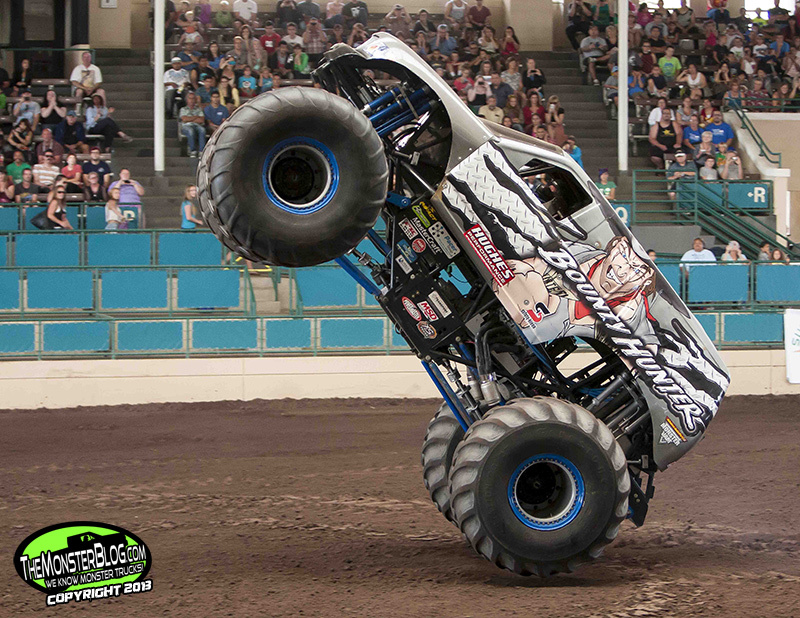 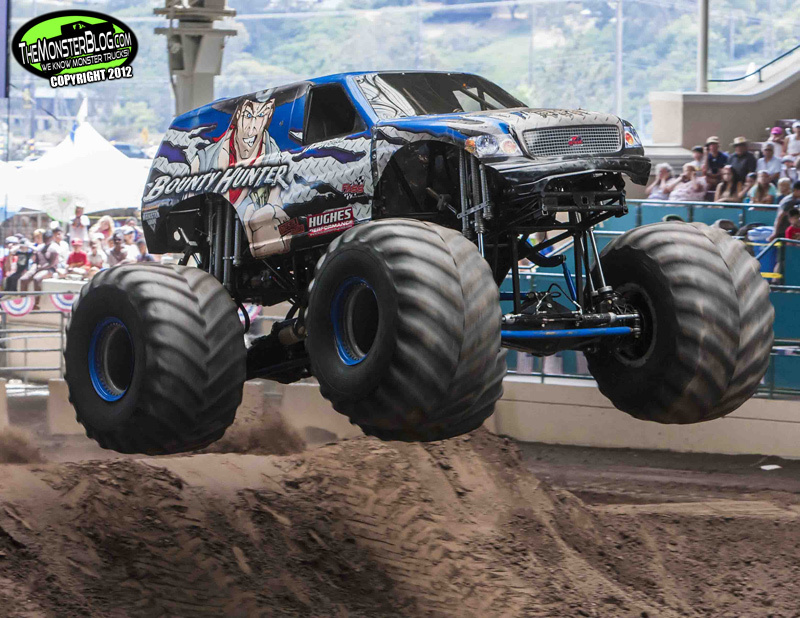 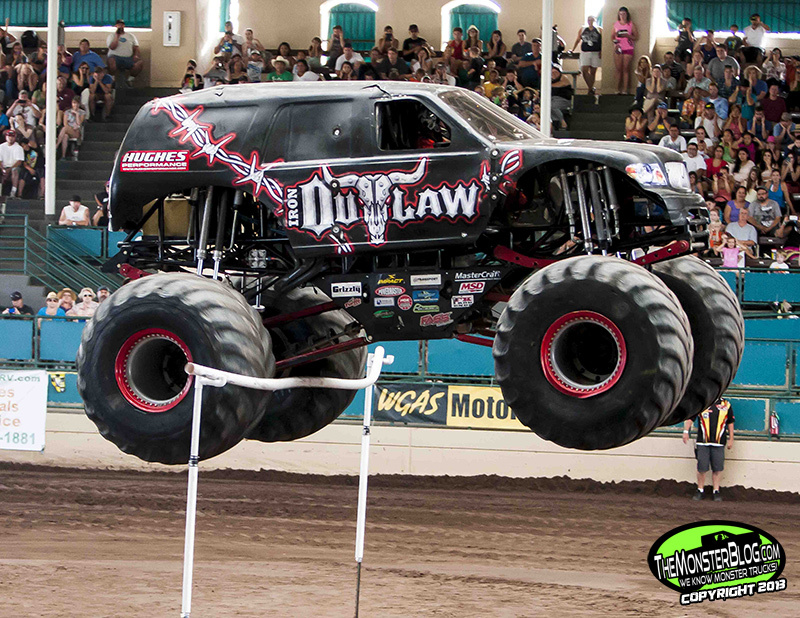 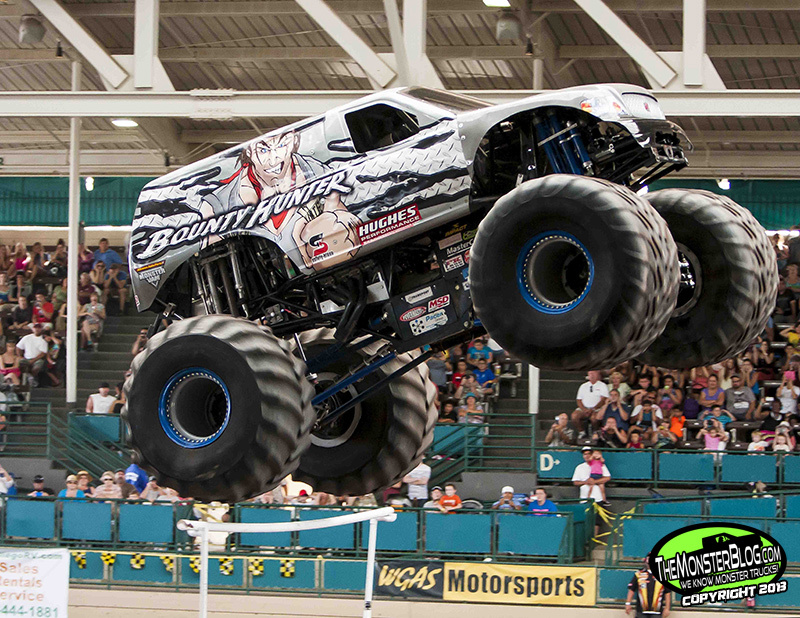 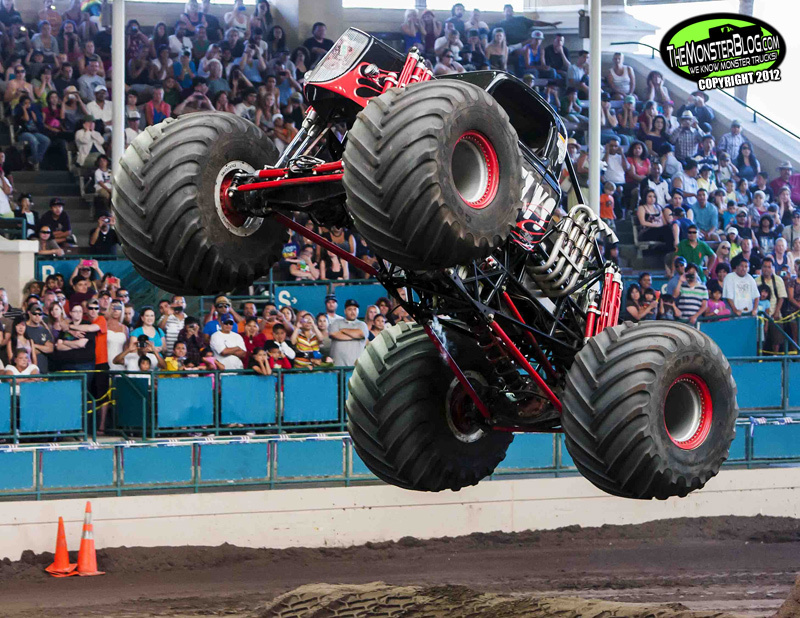 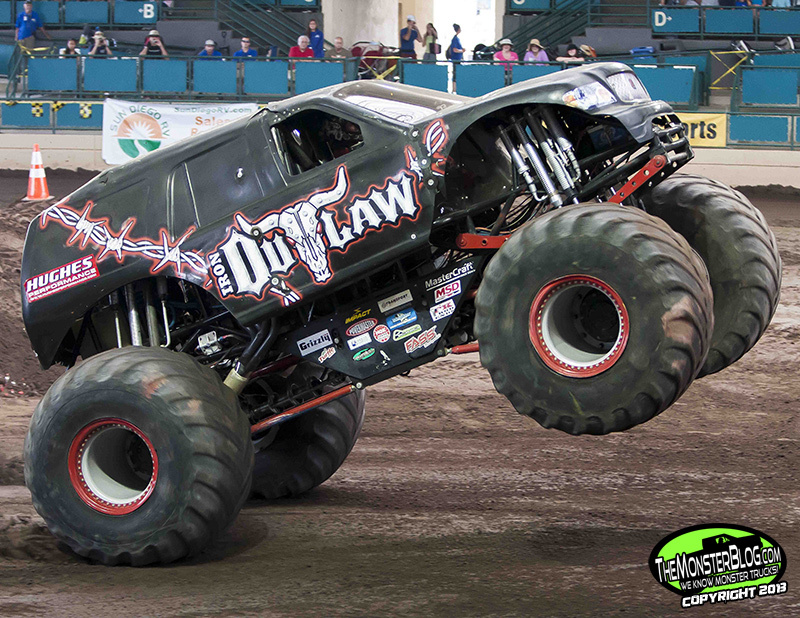 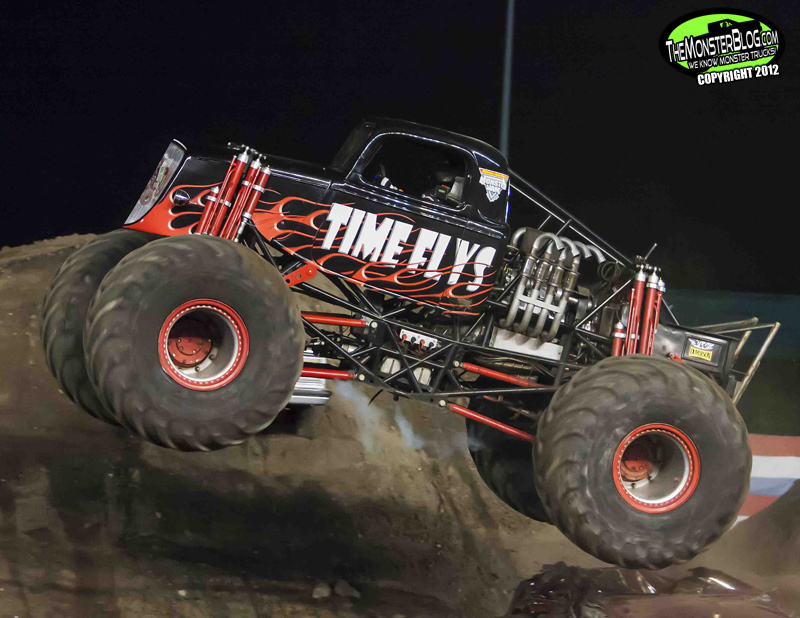 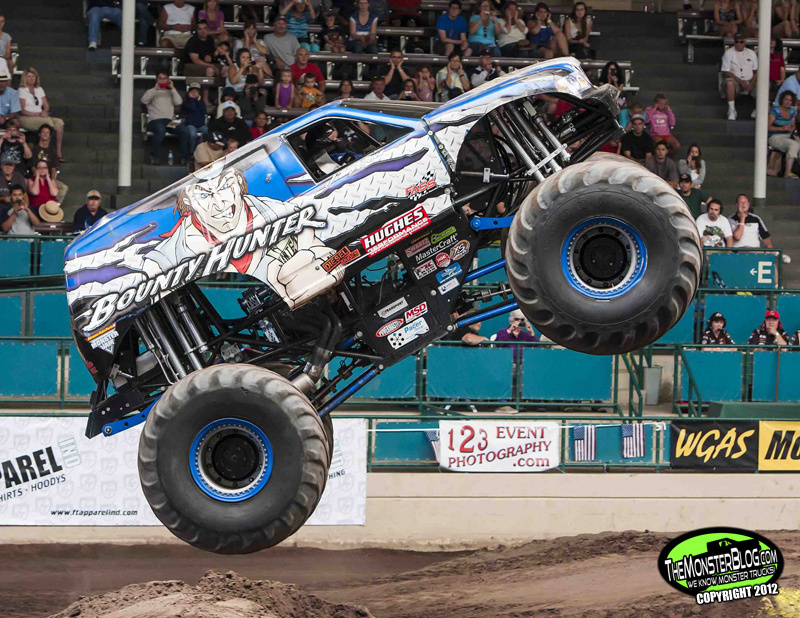 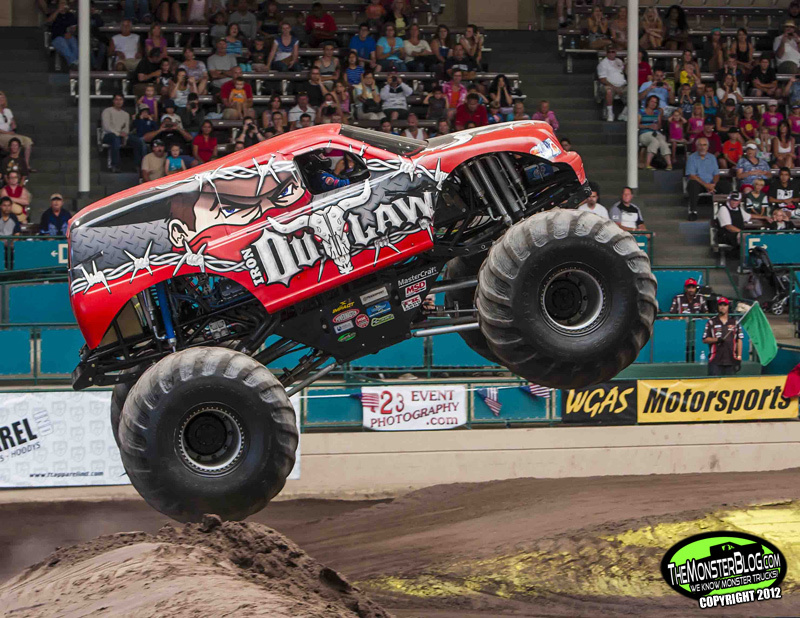 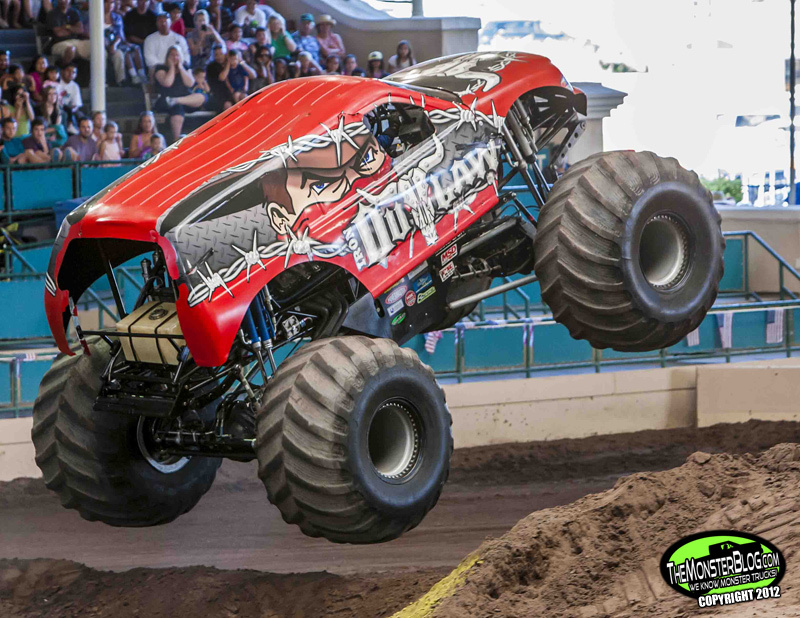 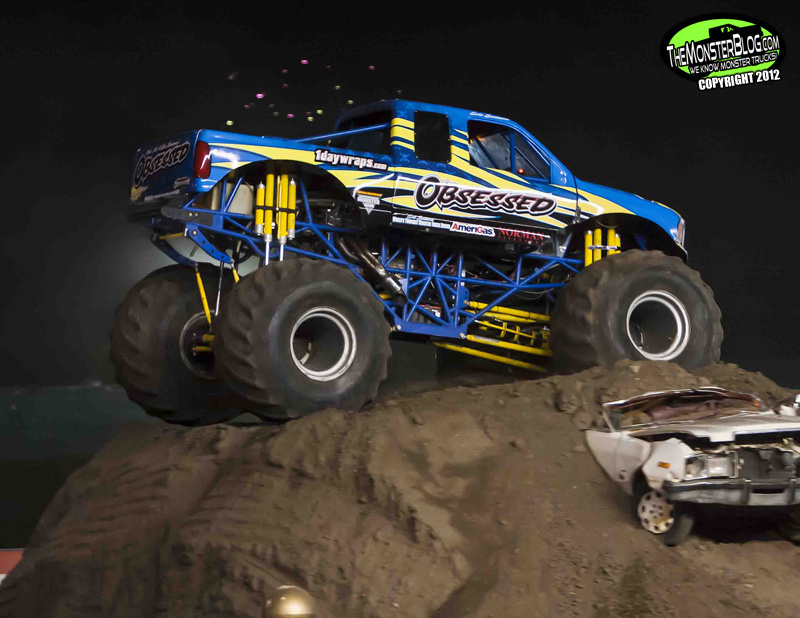 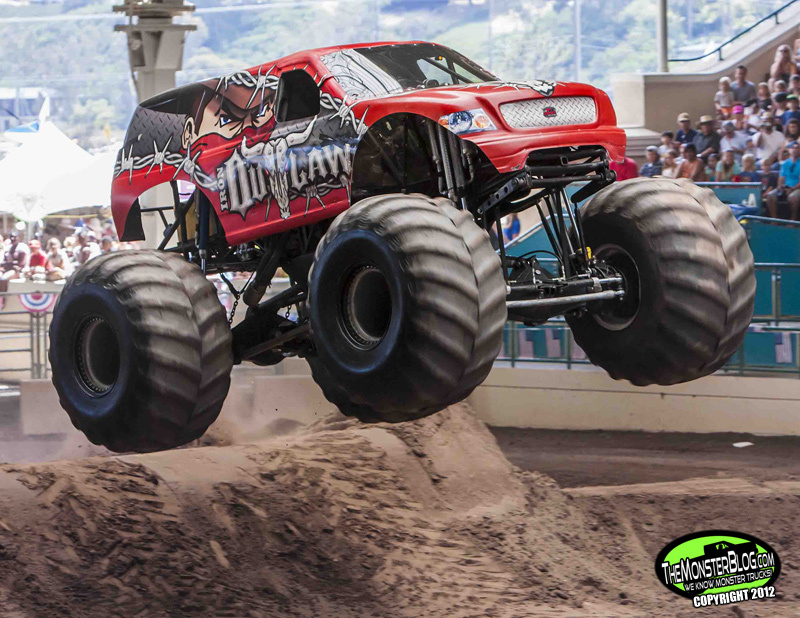 Some of the biggest names from the West Coast would battle it out in wheelie, racing, and freestyle competitions, including the Monster Truck Mafia’s Rock Star and California Kid, this year’s breakout star Donald Epidendio in Titan and California superstars Time Flys and Fired Up. 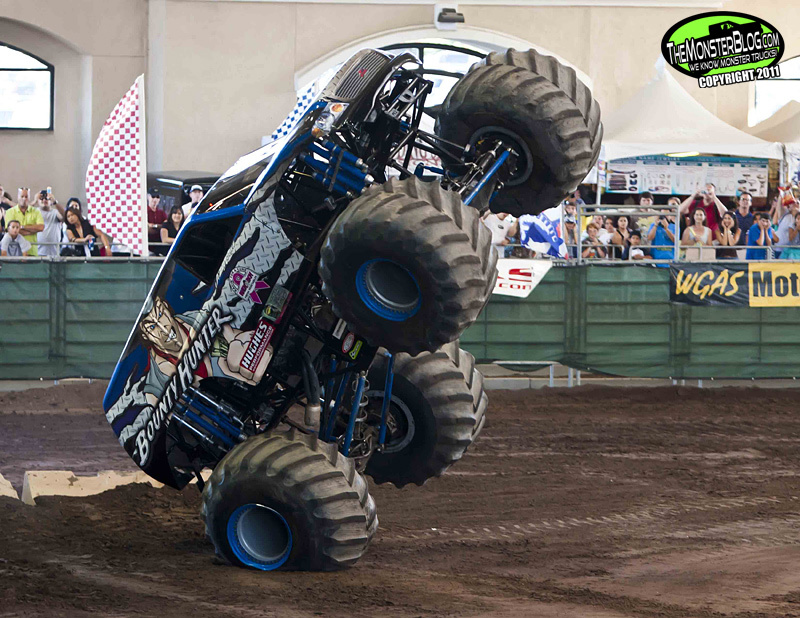 Friday night’s action would begin with a with a 2 hit wheelie contest as each truck would hit a 6 car stack then swing around to a slap wheelie bump. 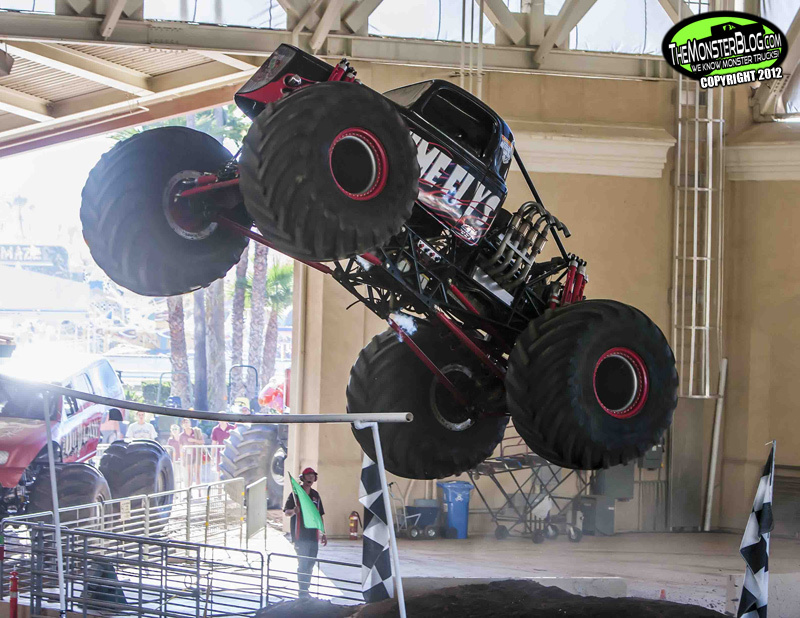 It was Garrett Ladelle in California Kid setting the bar with a nice vertical wheelie and slap wheelie to start the competition. 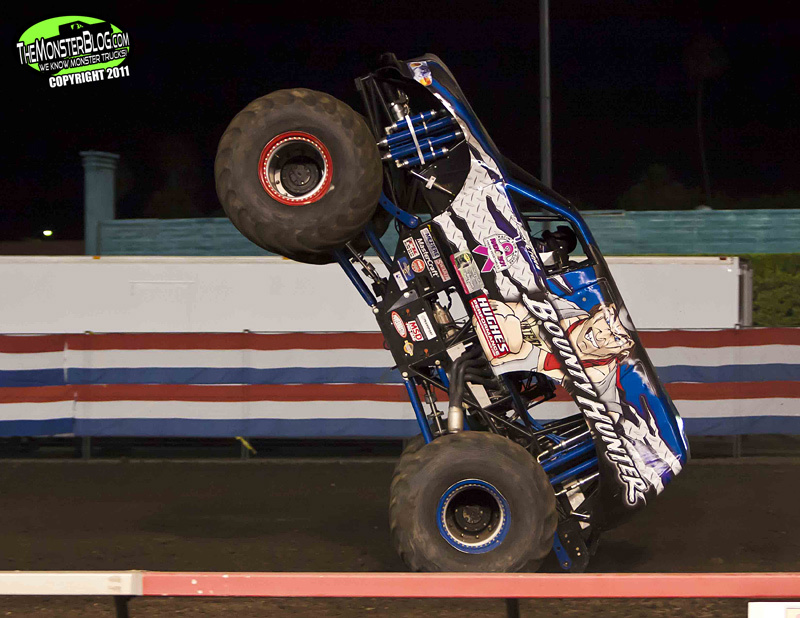 After efforts from rookie T.J. Etchison in Fired Up and Kelvin Ramer in Time Flys, Donald Epidendio would come out and raise the bar with a massive vertical sky wheelie on the car stack and though he missed a slap wheelie the first time, an impromptu hit on the van stack would provide the bounce needed for a huge slap wheelie. 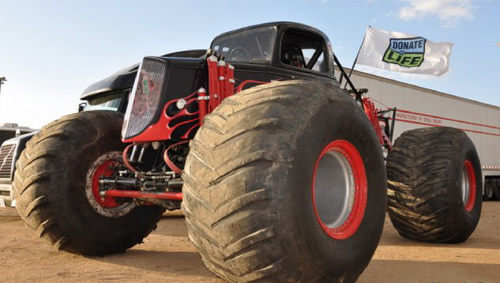 Finally, Bill Payne would bring his new Rock Star out for its first hit outdoors. Payne jammed the brakes before the car and matted Rock Star, ultimately sending the truck past vertical and onto its roof. 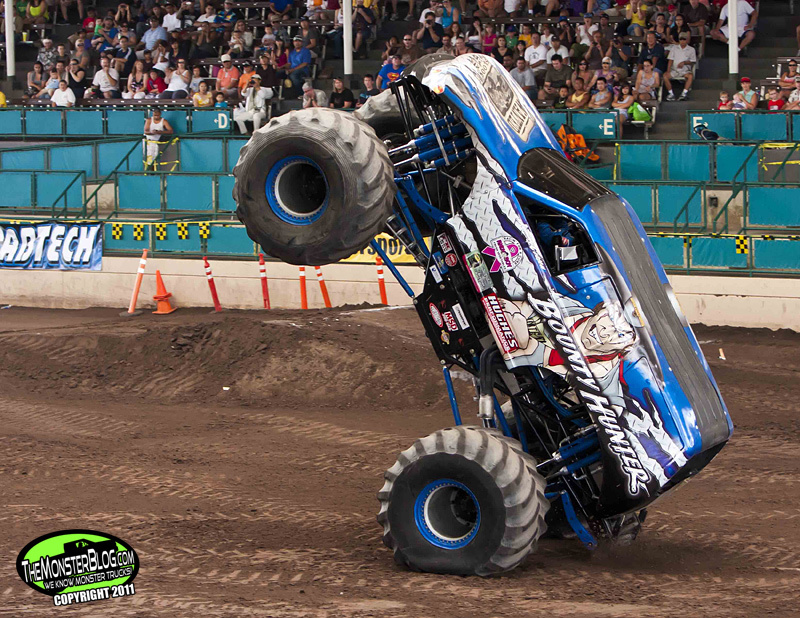 Bill would wait for the truck to be flipped back over and deliver a quick freestyle to the fan’s delight, giving Rock Star the wheelie contest win. 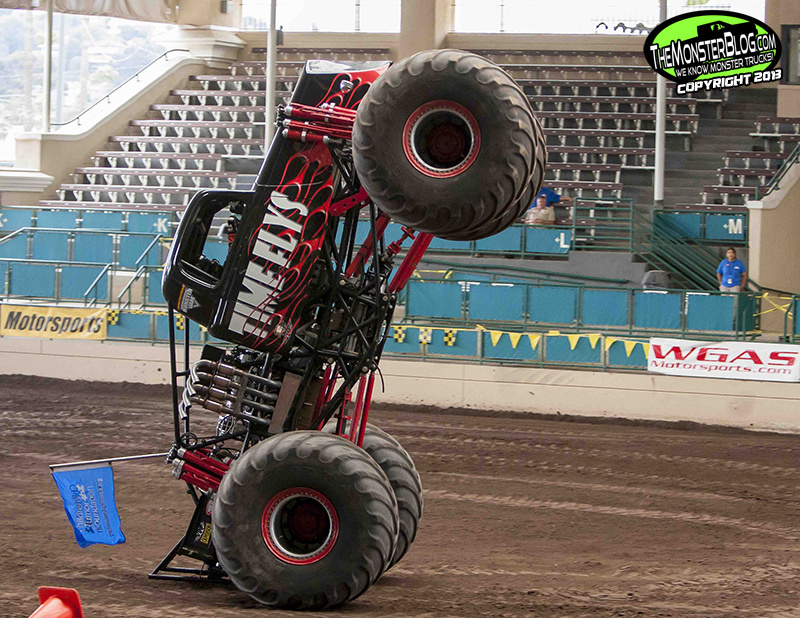 Bill Payne in Rock Star wins the Friday wheelie contest with a wild past vertical effort and rollover. 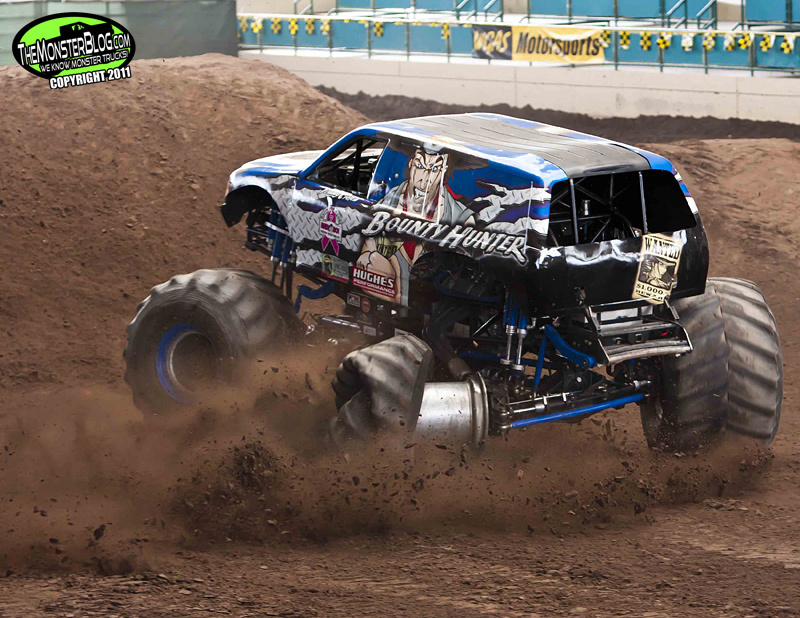 Racing would be tricky as the Monster X Tour crew created a challenging over-under, figure 8 track. 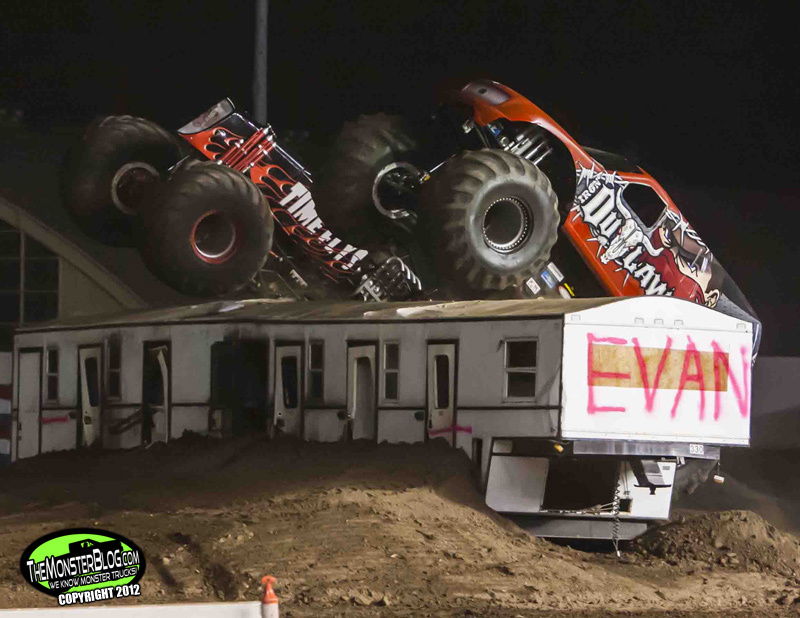 In past over-under tracks, the chances of one monster jumping over another were slim to none. 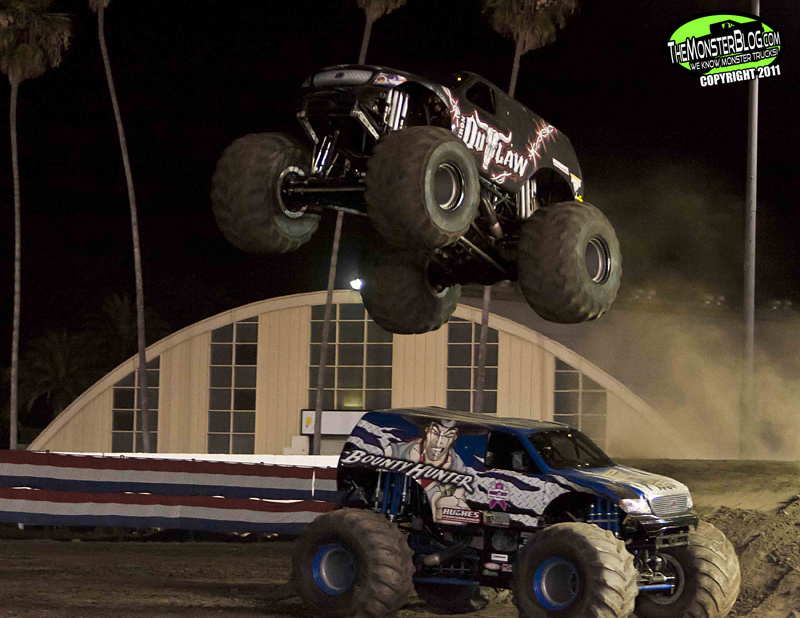 This over-under was the exactly the opposite which created some exciting, but tense moments. 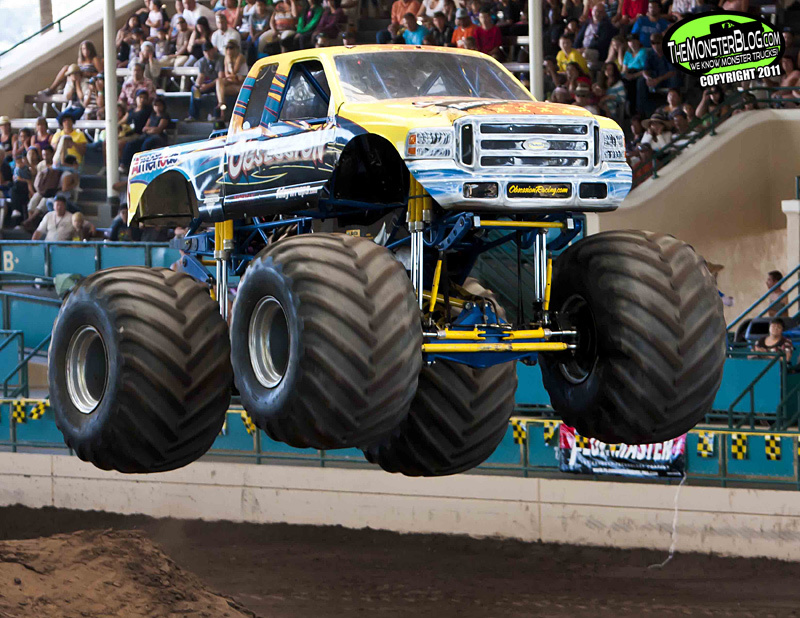 Each truck would start at the base of each lane, putting one truck right above another much to the delight of the Chico fans. 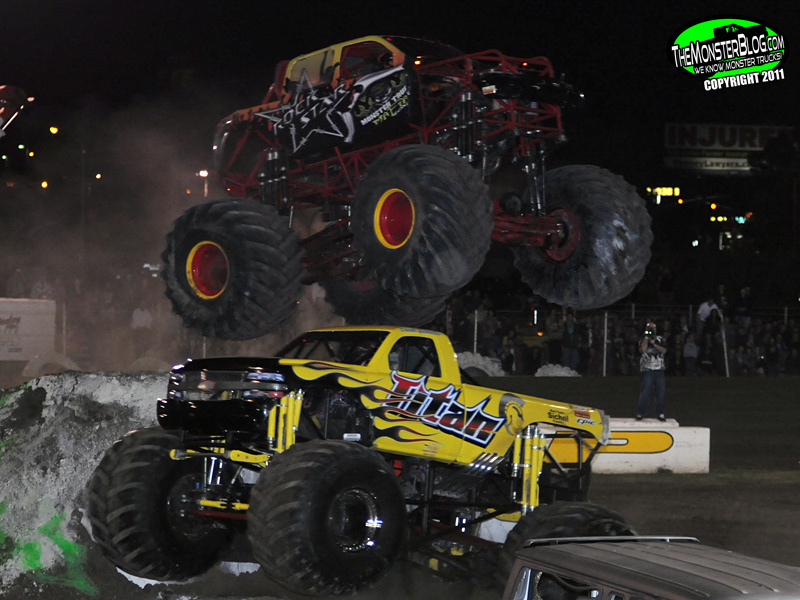 The final round would come down to teammates Garrett Ladelle in California Kid and Bill Payne in Rock Star. 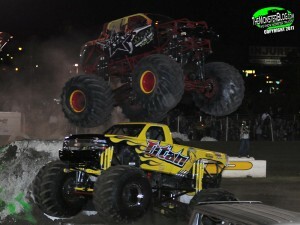 Payne would bobble in the final turn, handing the win to Garrett in the Kid who laid down a flawless pass. 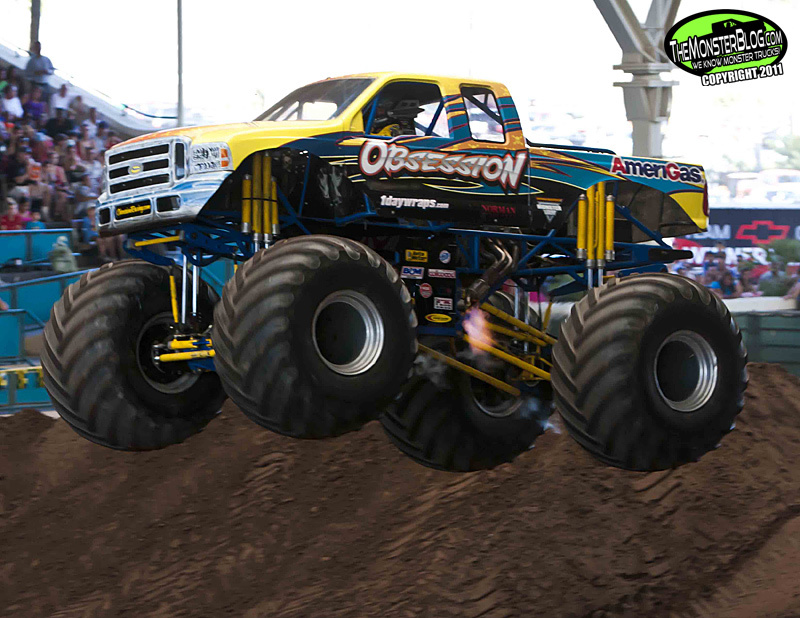 Garrett was particularly excited about the win as it came on the one year anniversary of the first time he ever drove a monster truck. 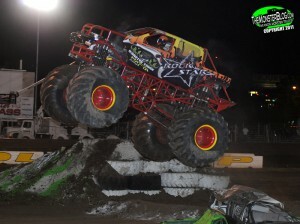 Garrett Ladelle celebrates his one year anniversary of his first time driving a monster truck by taking a big racing win. 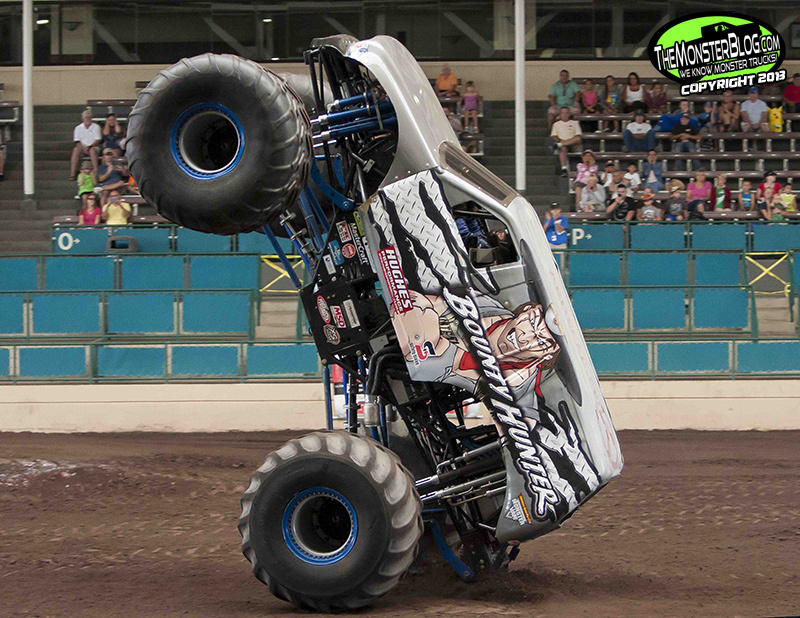 The final competition of Friday’s show would be freestyle and all drivers let it hang out. 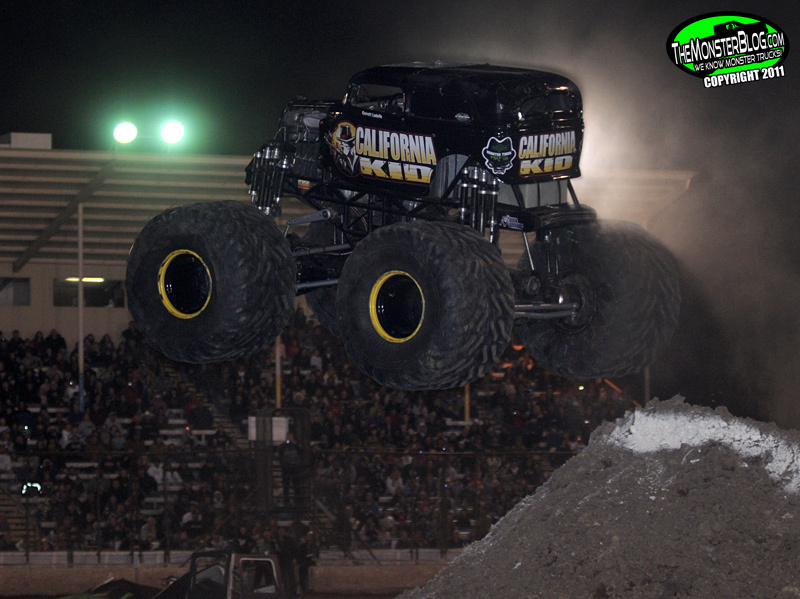 Right out of the gate, it was California Kid getting wild and almost sending the truck end over end followed by Kelvin Ramer with some big air in Time Flys. Next out was Donald Epidendio in Titan in one of the best runs TMB has seen in quite some time. 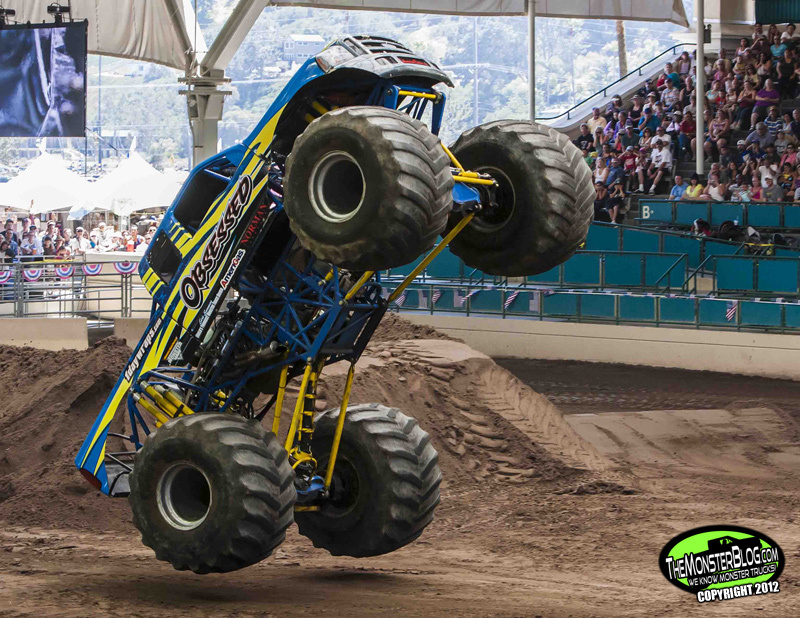 Donald launched Titan off of every obstacle, rocked some sick cyclones in the mud, and some great vertical wheelies to the roaring approval of the fans. 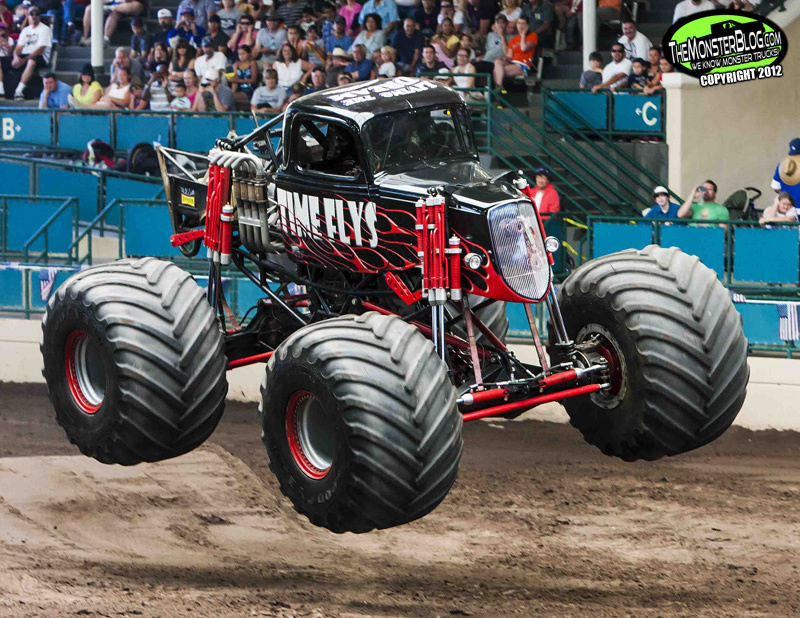 Knowing he had to go big, Bill Payne only made it three hits into his run before a 3/8’’ bolt let go in the driveline, ending his run short and leaving the freestyle title to Epidendio in Titan. 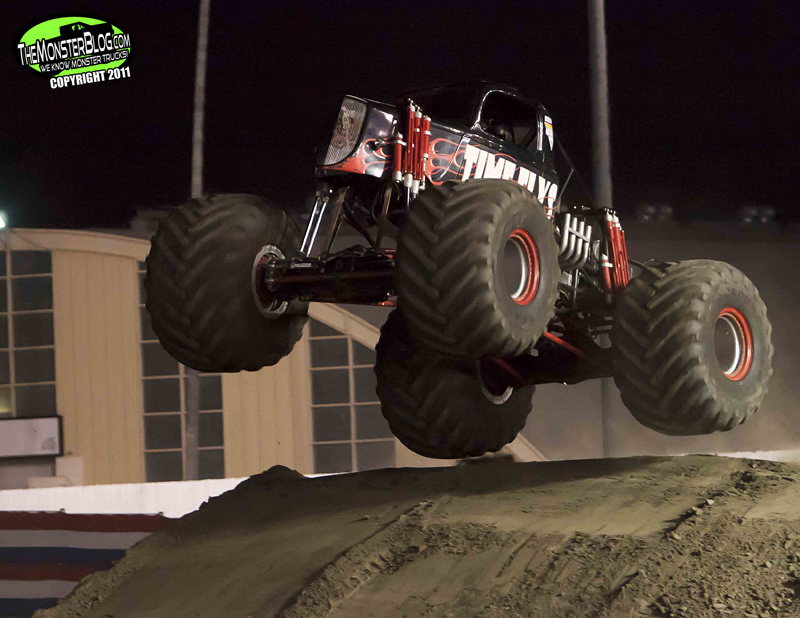 Donald Epidendio lays down one of the better runs we've seen in a long time to give Titan the Friday night freestyle win. 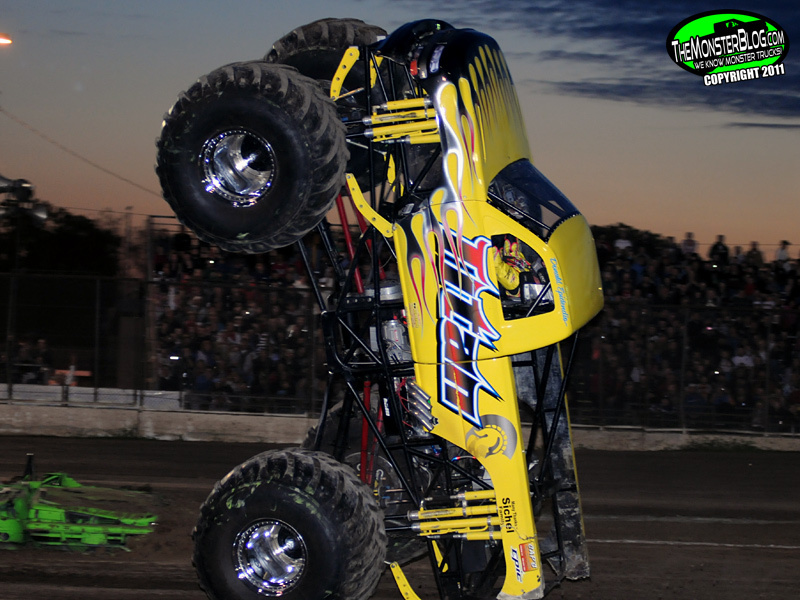 The weekend finale on Saturday night started out with one of the best collective wheelie contests that TMB has seen in some time. 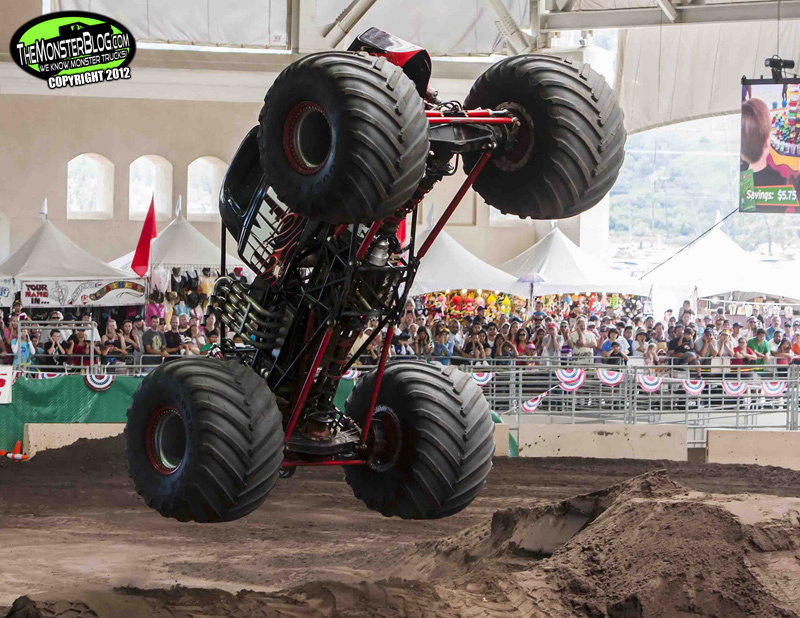 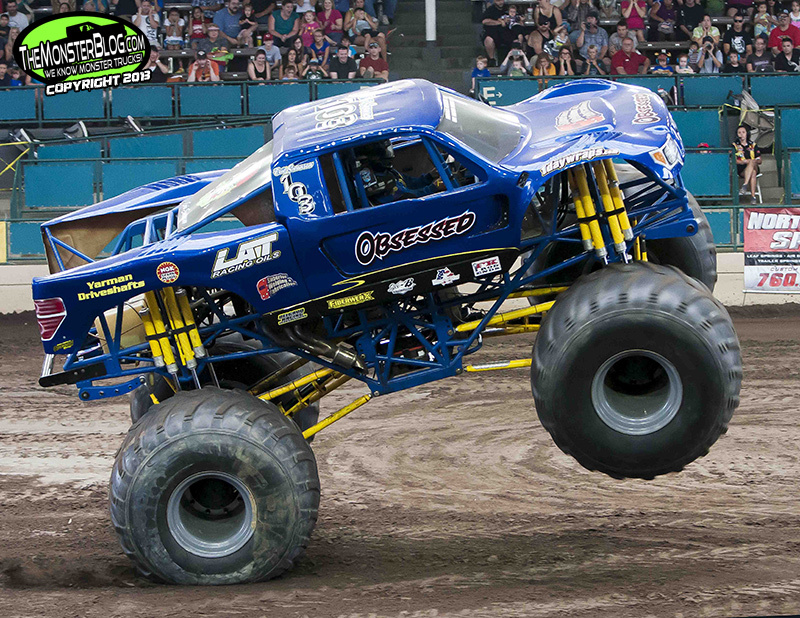 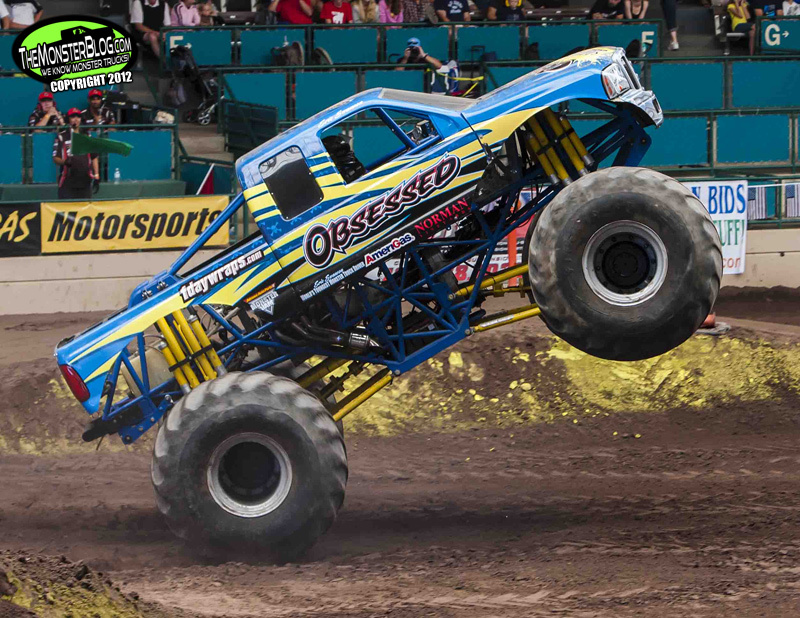 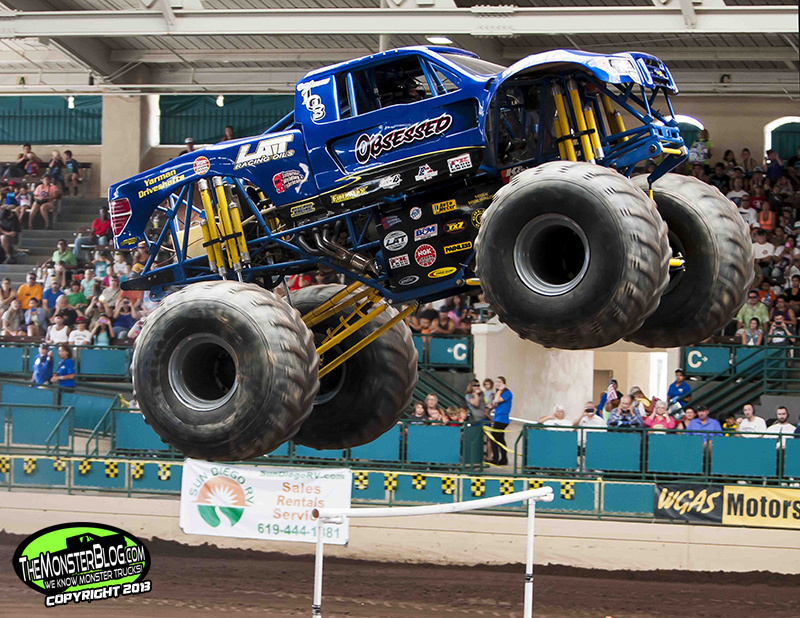 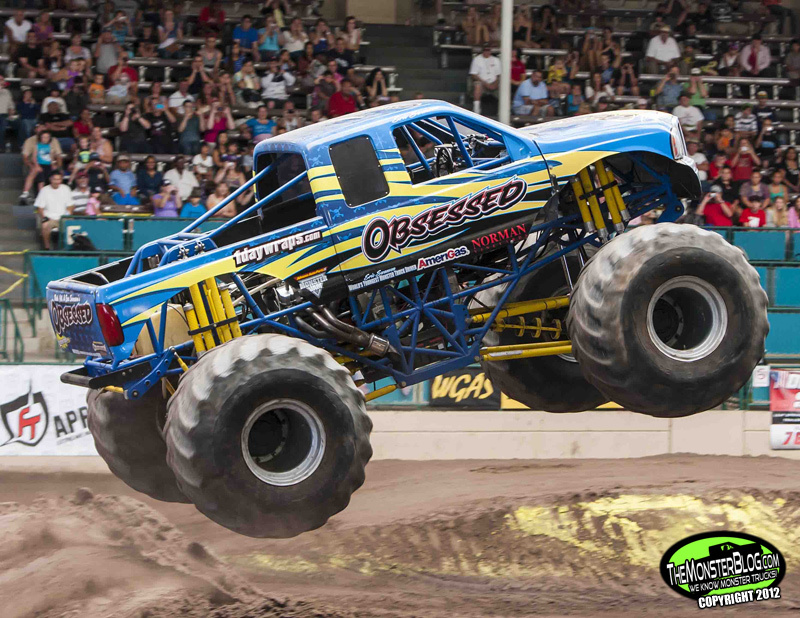 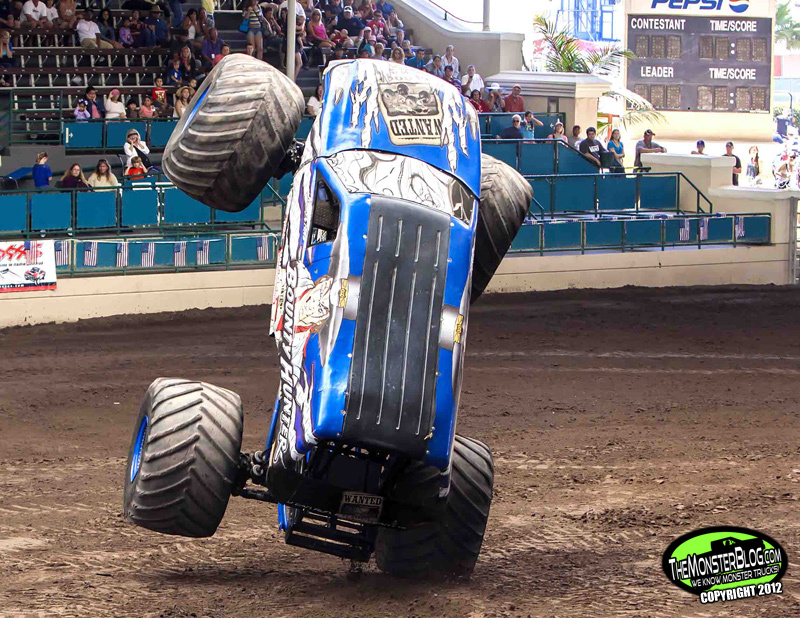 It all came down once again to Titan and Rock Star, as Titan was again vaulted past-vertical into the 5th car of the 6 car set and drove the truck to an insane one wheeled slap wheelie. 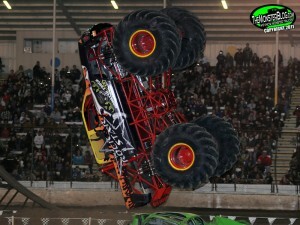 Payne once again rolled Rock Star over backward and followed up with a quick freestyle after being turned over. 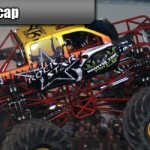 In a questionable call, it was Payne in Rock Star getting the win to sweep both wheelie contests on the weekend based on the rollovers and freestyles while Epidendio had the most impressive efforts. 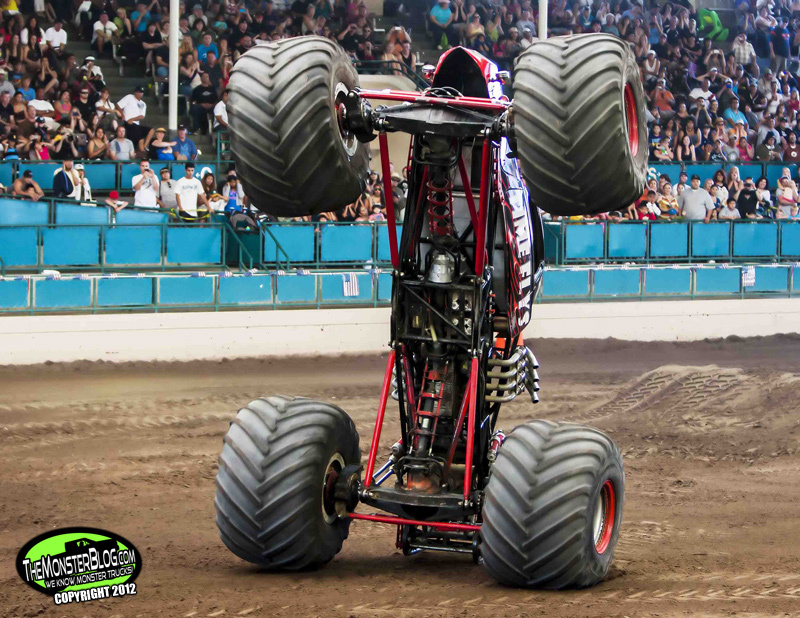 Absolutely jaw-dropping effort from Titan as Epidendio puts it up in a one wheeled slap wheelie. 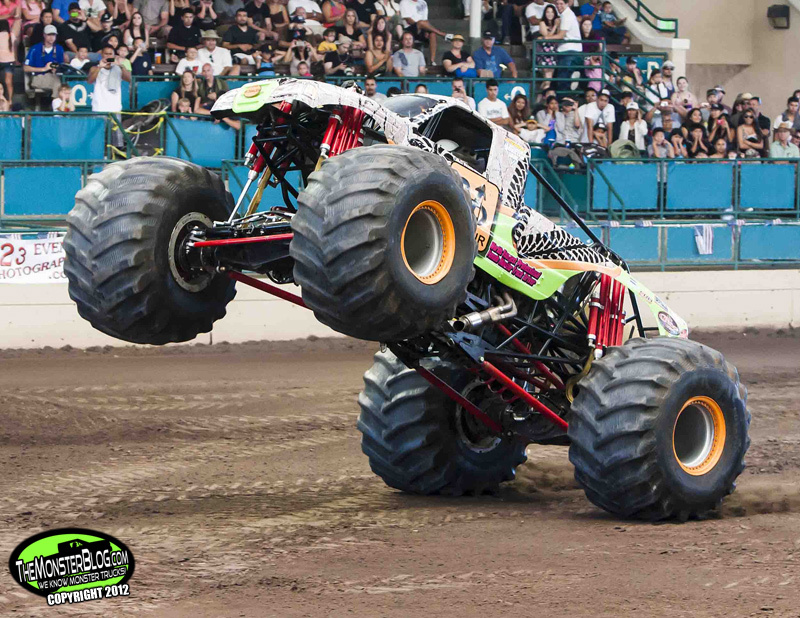 Racing would see the same two drivers continue to battle it out as Payne and Epidendio won their respective races to meet in the finals. 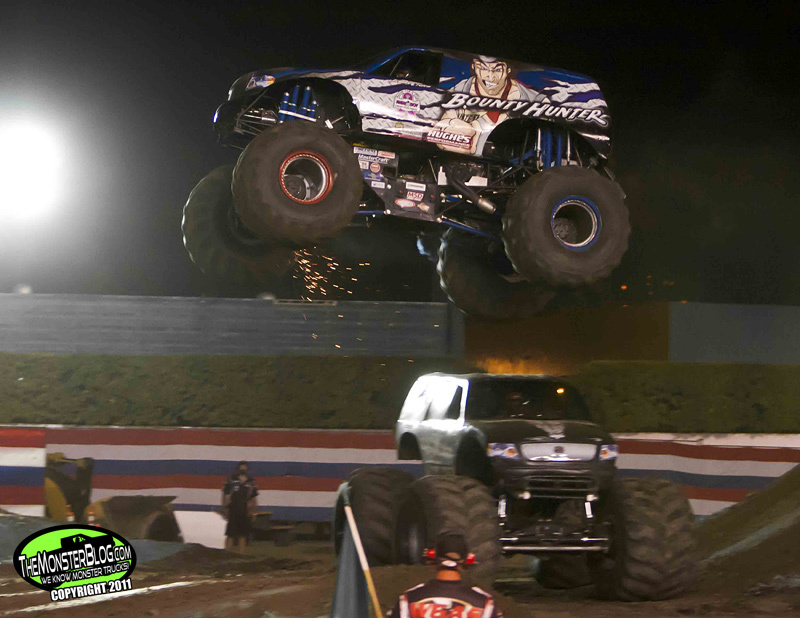 After a close start, Epidendio would bobble in the turn and Payne would make a flawless run to take the victory. 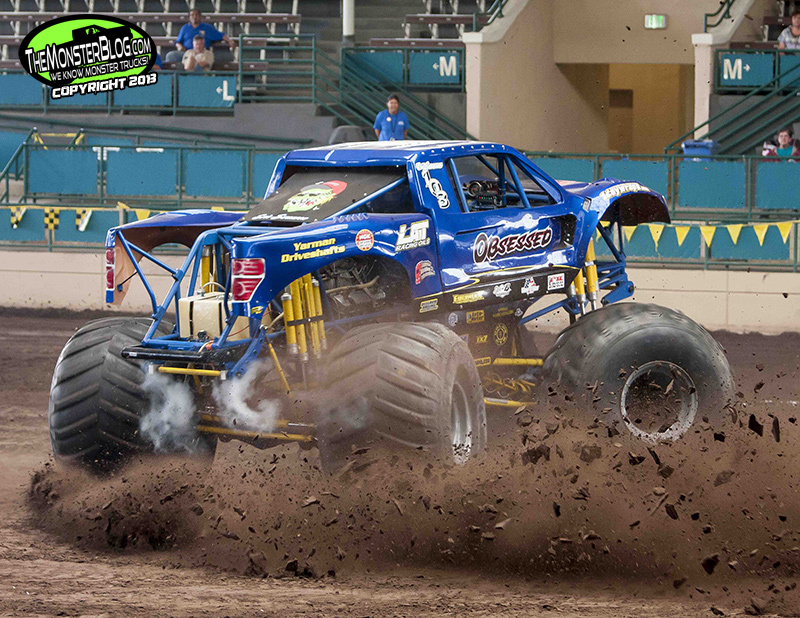 Donald Epidendio had the edge at the start but it was Bill Payne taking the Saturday racing win. 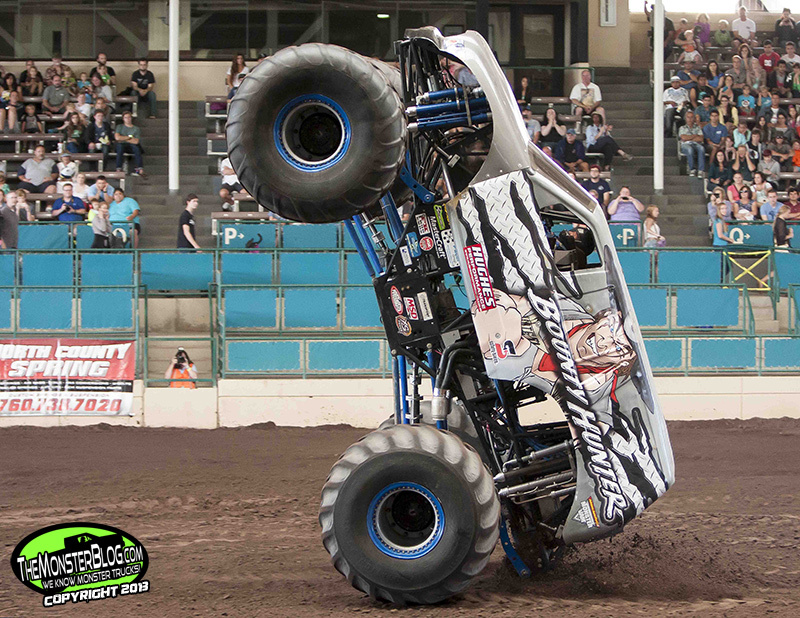 The final competition of the weekend would be freestyle. 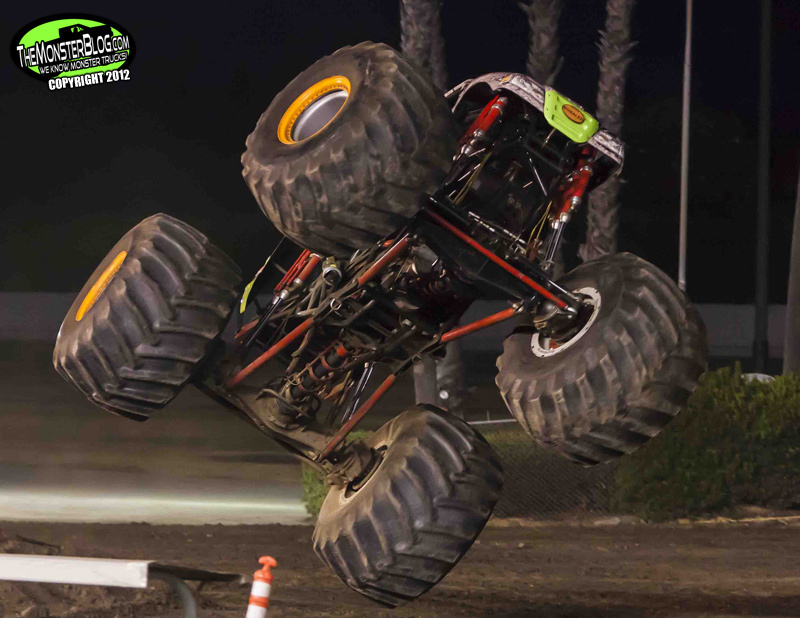 Teammates TJ Etchison and Kelvin Ramer would both perform nice donuts and wheelies and Garrett Ladelle in California Kid would pose a formidable run before the transmission went out. 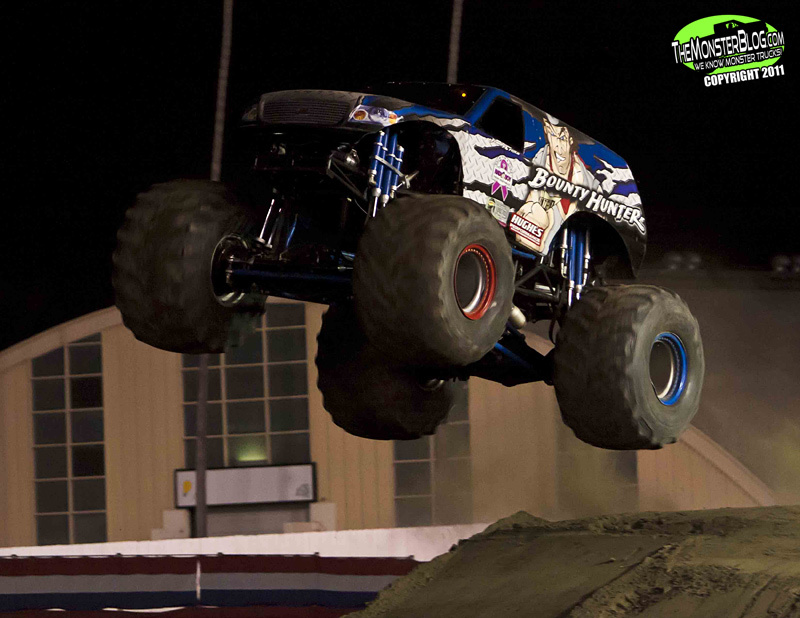 Again, Donald Epidendio would pilot Titan to a high-energy and big air filled run to the roaring approval of the Chico fans, but it was Payne in Rock Star that would come out with an insane run, ultimately ending in a backwards rollover after pile driving the backside of the over-under jump. 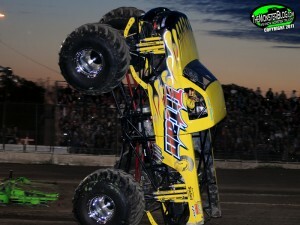 Bill Payne in Rock Star putting together an incredible run Saturday night to win the last competition of the weekend. 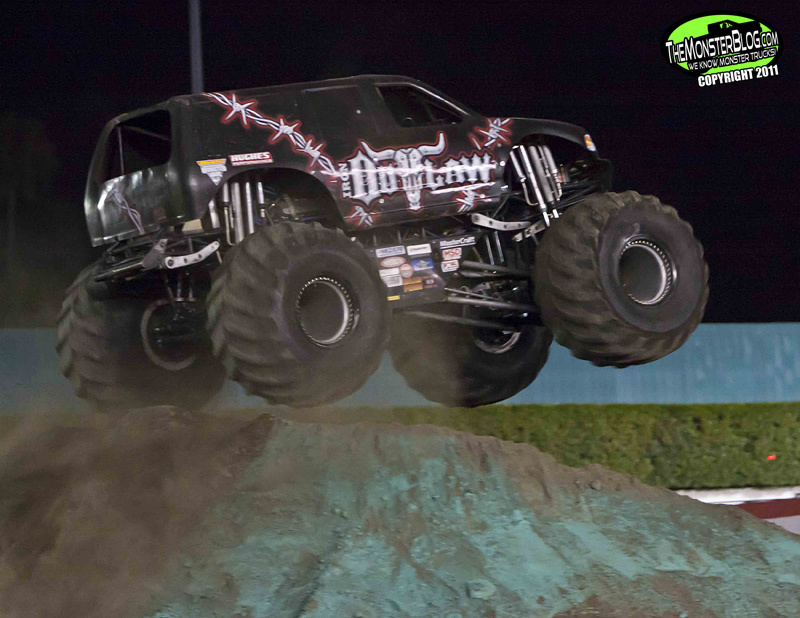 A big thanks goes out to Danny Torgerson and the Monster X Tour staff for their hospitality and having the TMB crew on hand for their first outdoor show of the season! 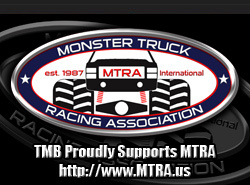 Stay tuned for a full photo gallery from TMB’s Ross Z. Bonar this week and don’t miss all the action from the weekend on TMB TV’s Original Series featuring incredible footage from Colby Marshall and Kaedon Berry. 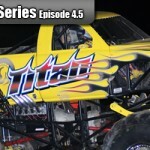 Episode 4.5 from Chico will debut on Wednesday, April 27th at 8PM eastern time with all the weekend’s monster truck competitions as well as some extras you won’t want to miss! 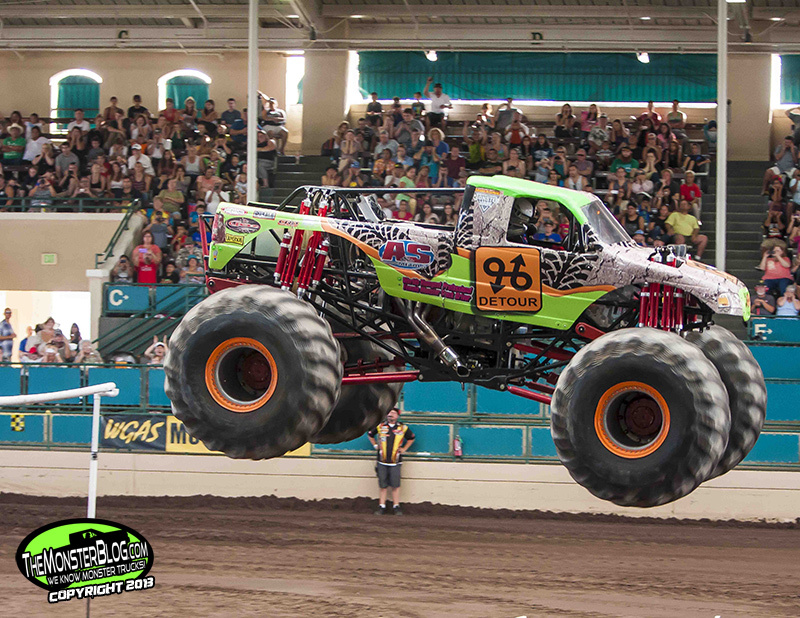 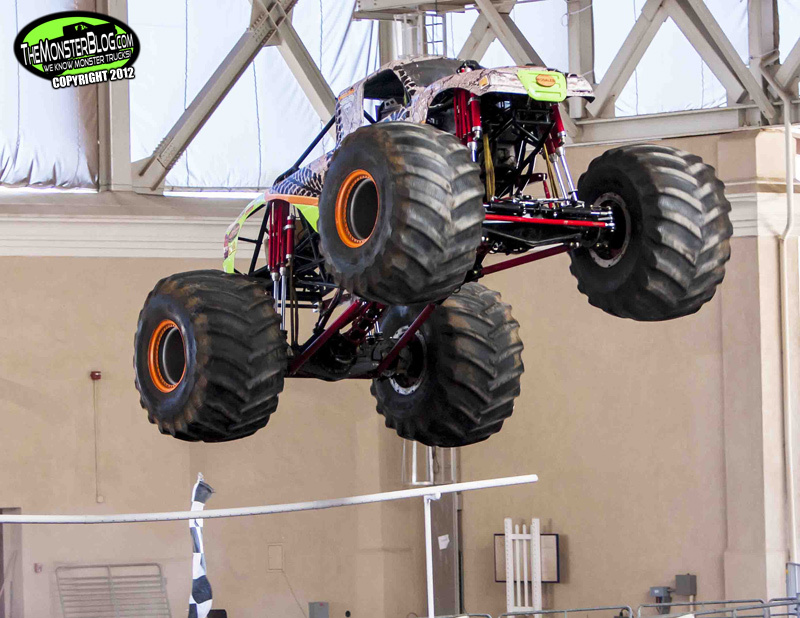 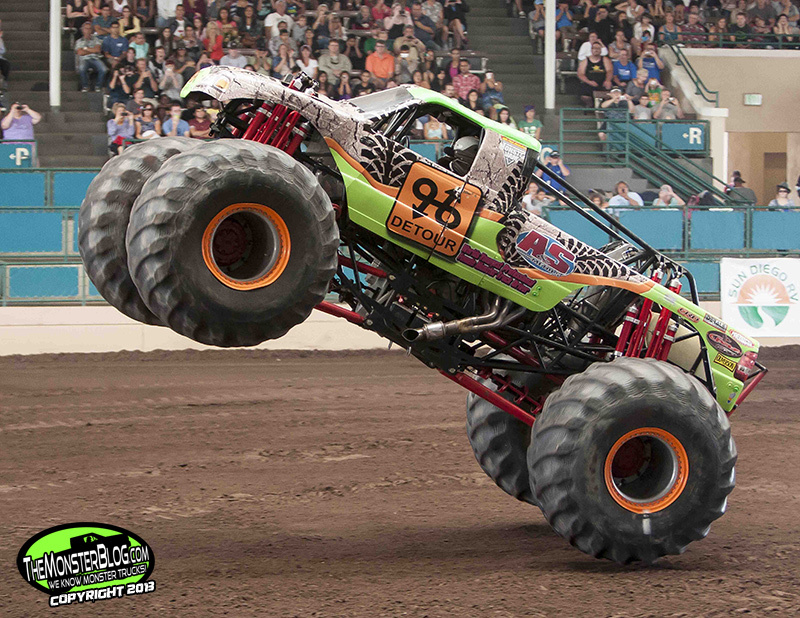 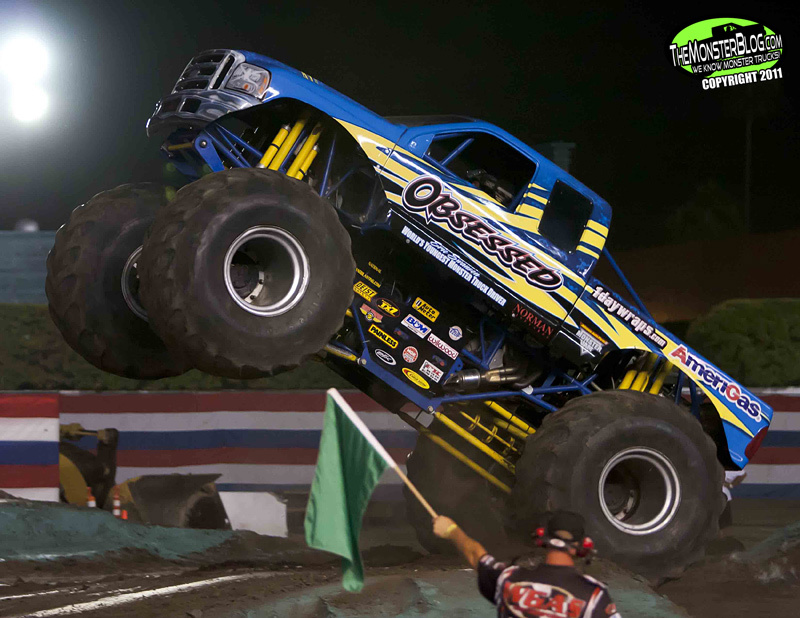 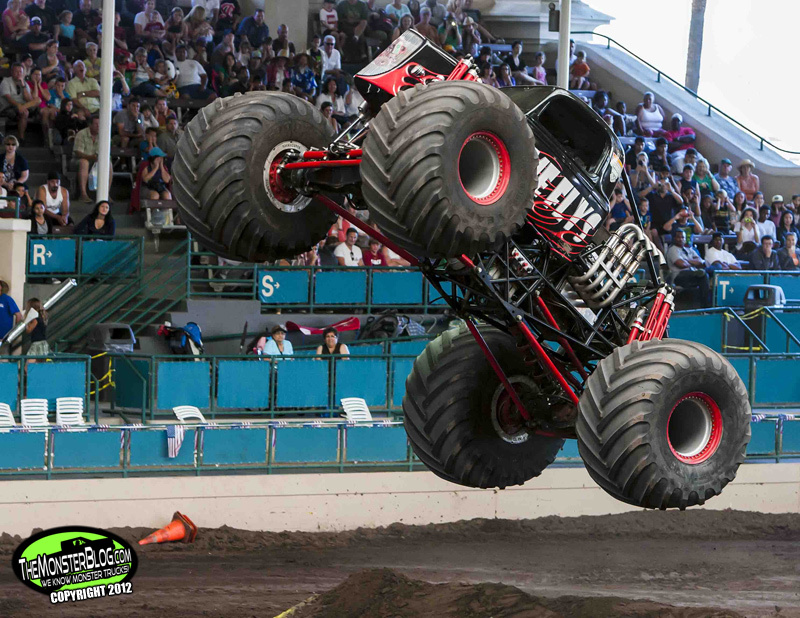 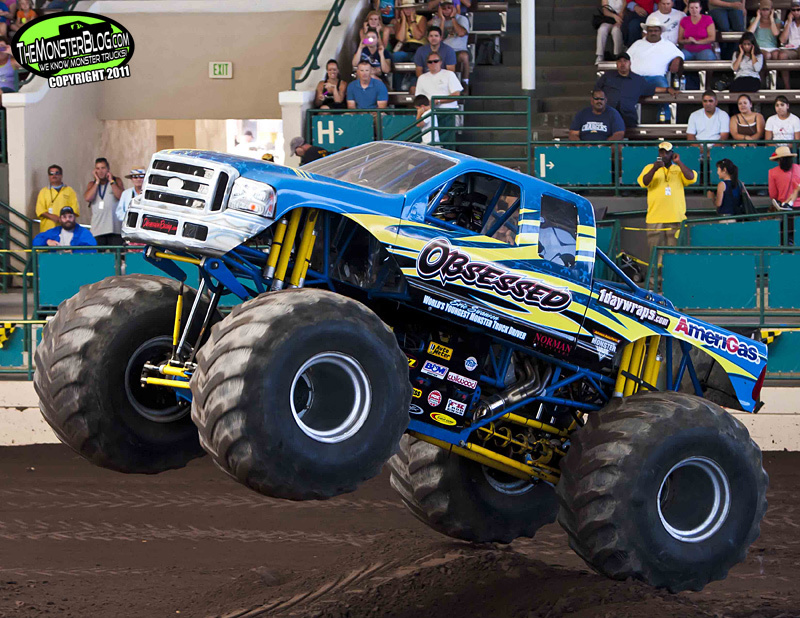 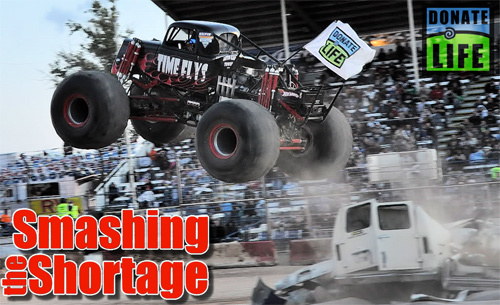 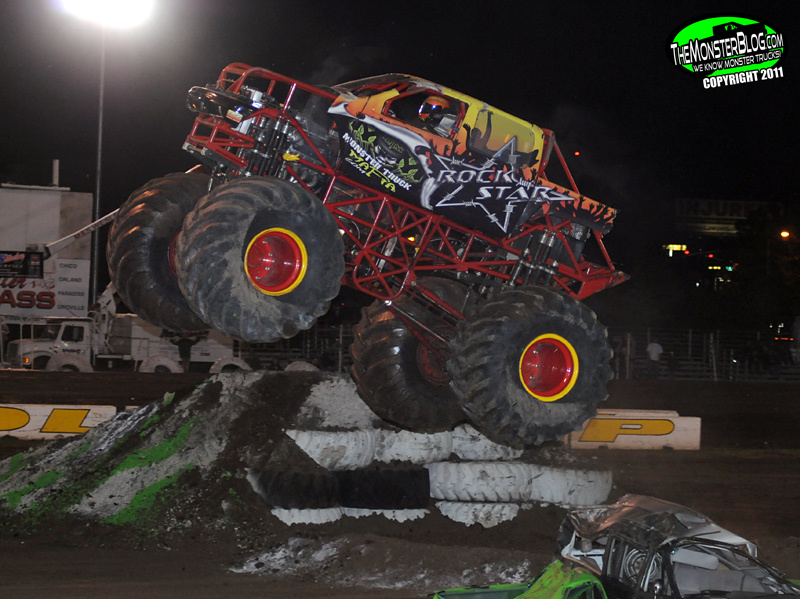 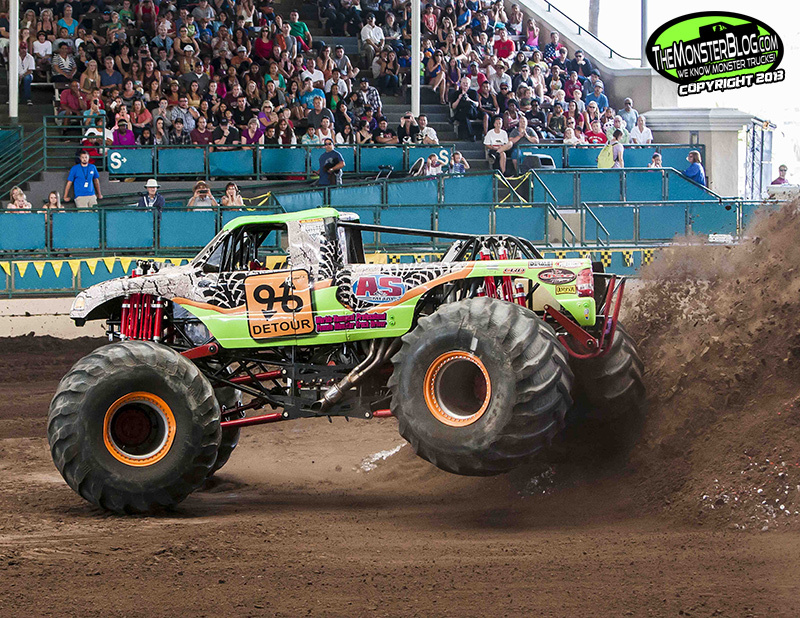 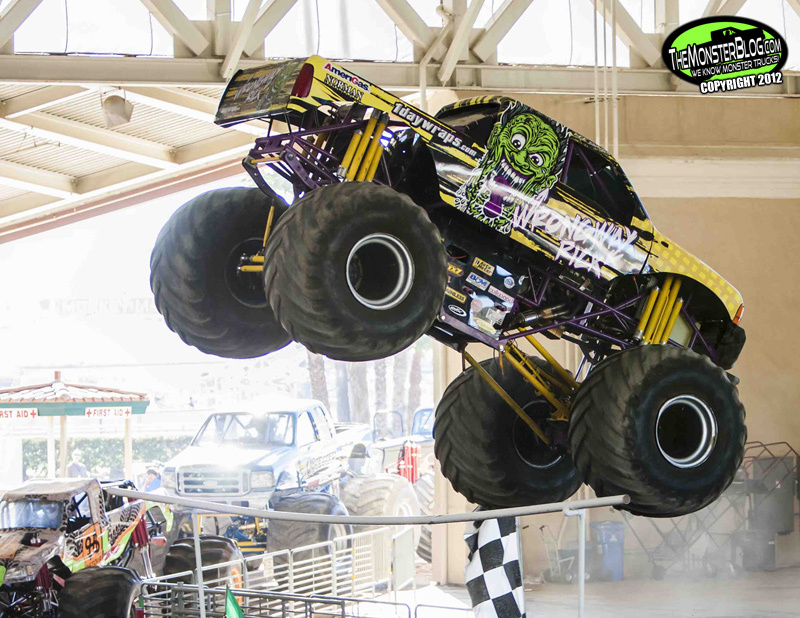 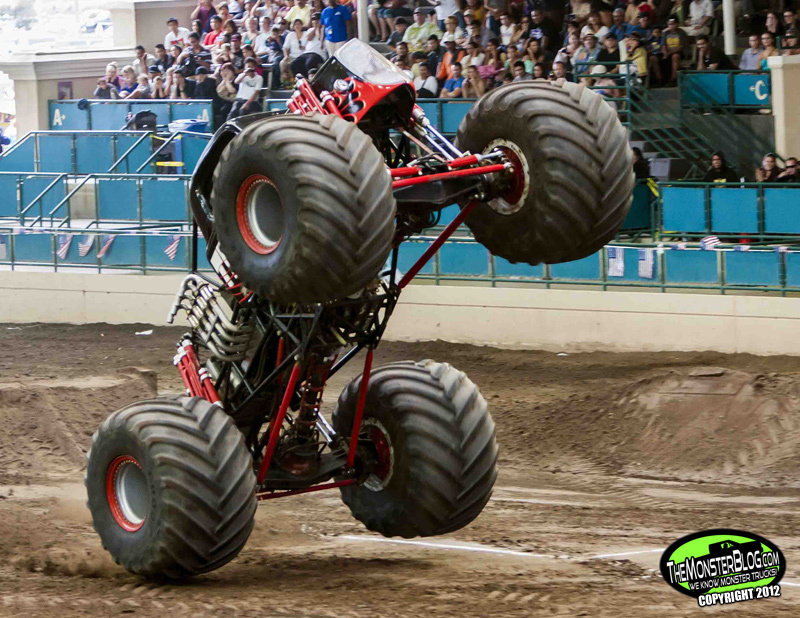 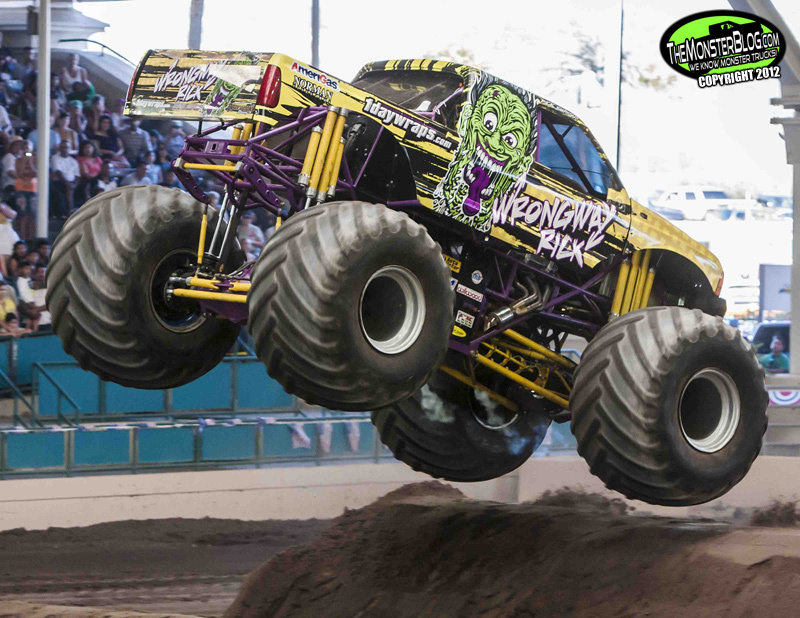 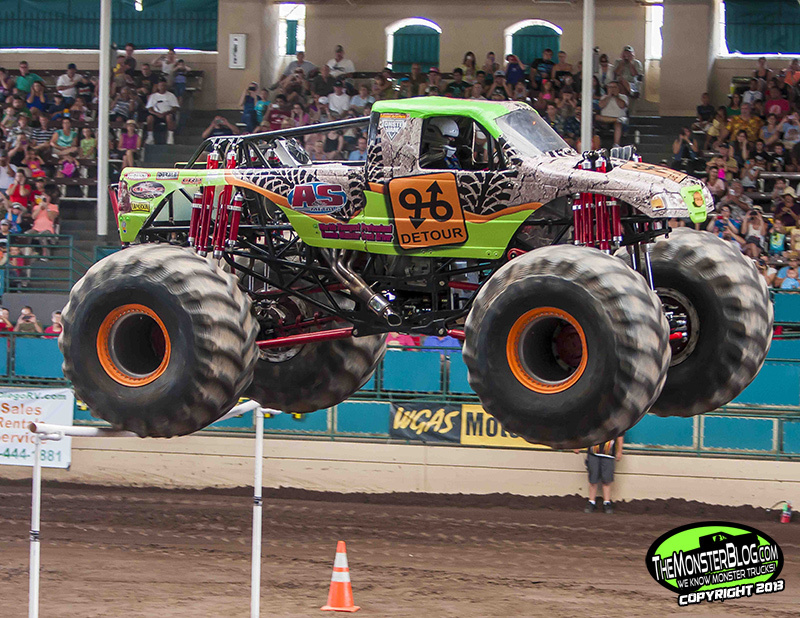 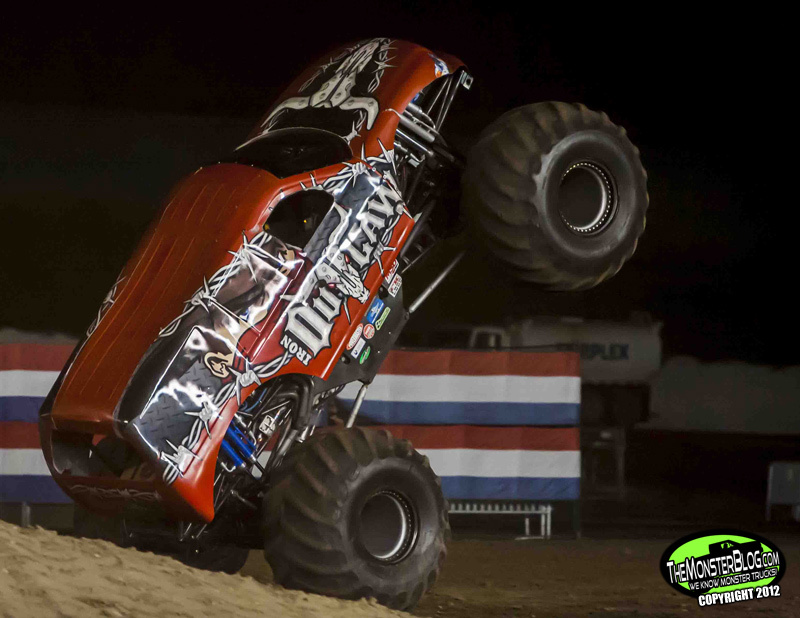 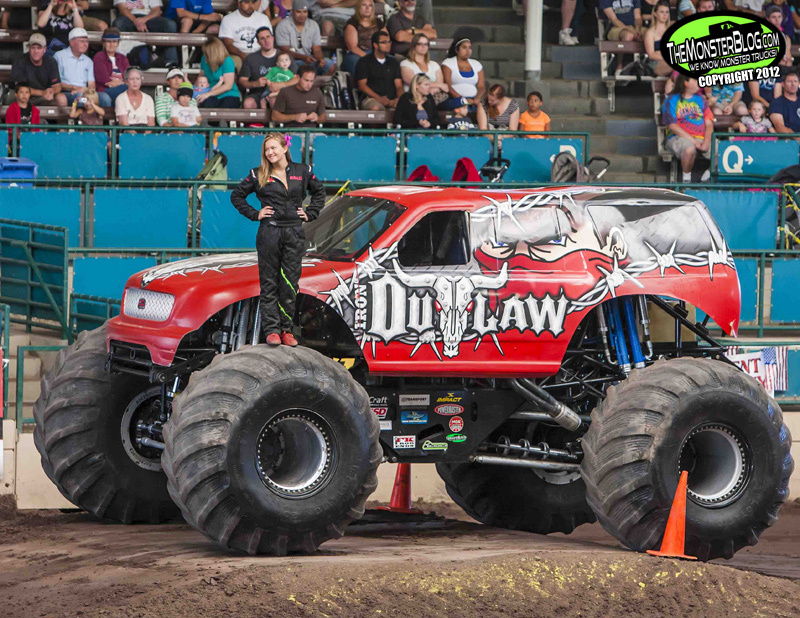 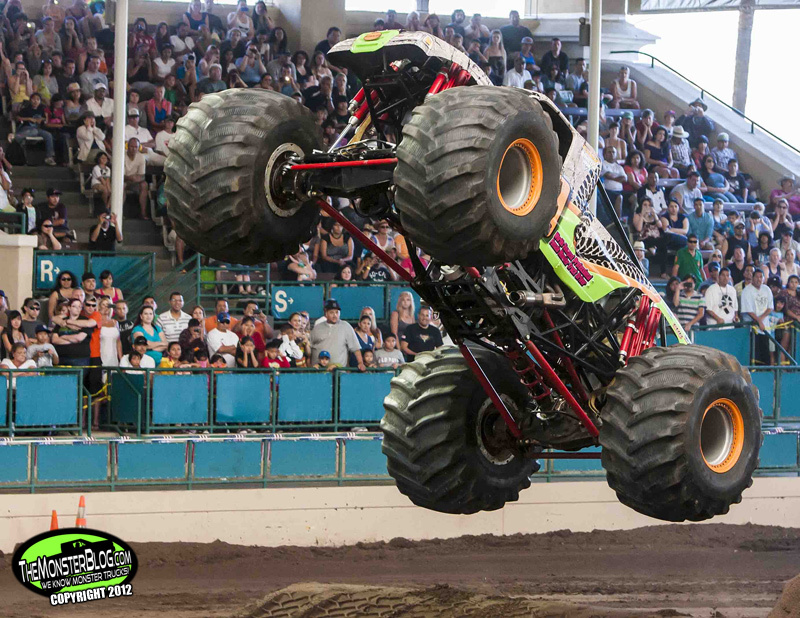 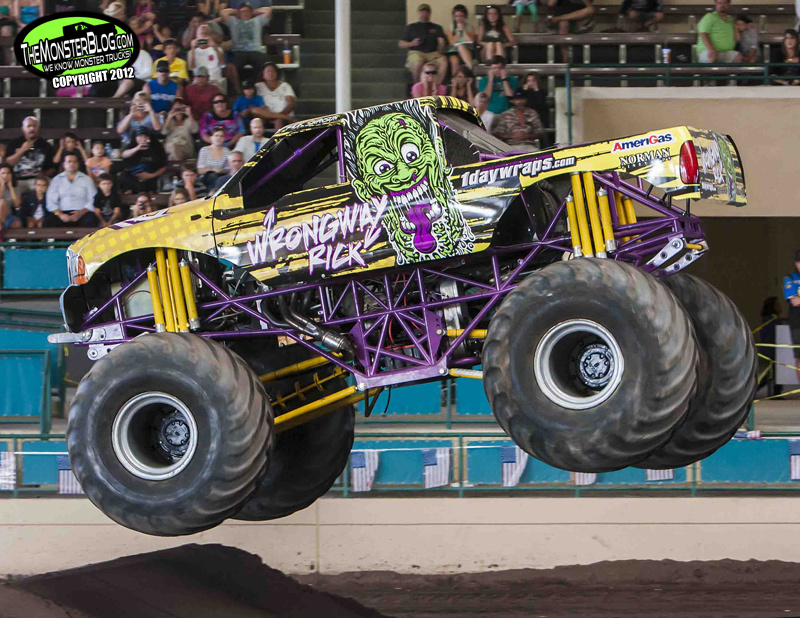 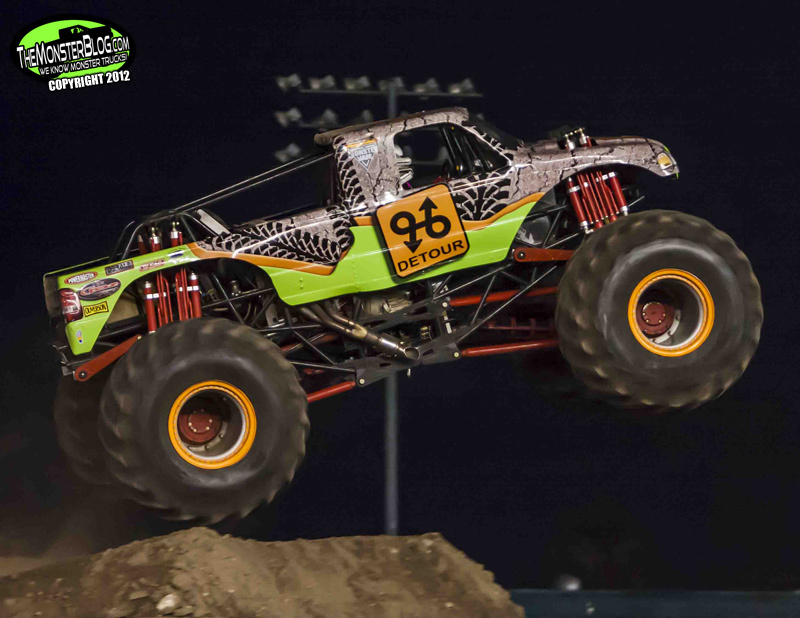 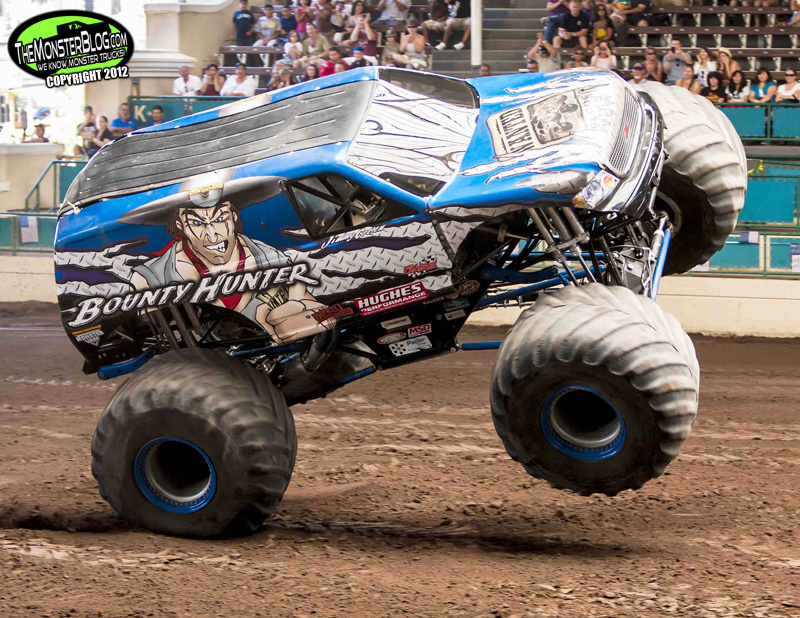 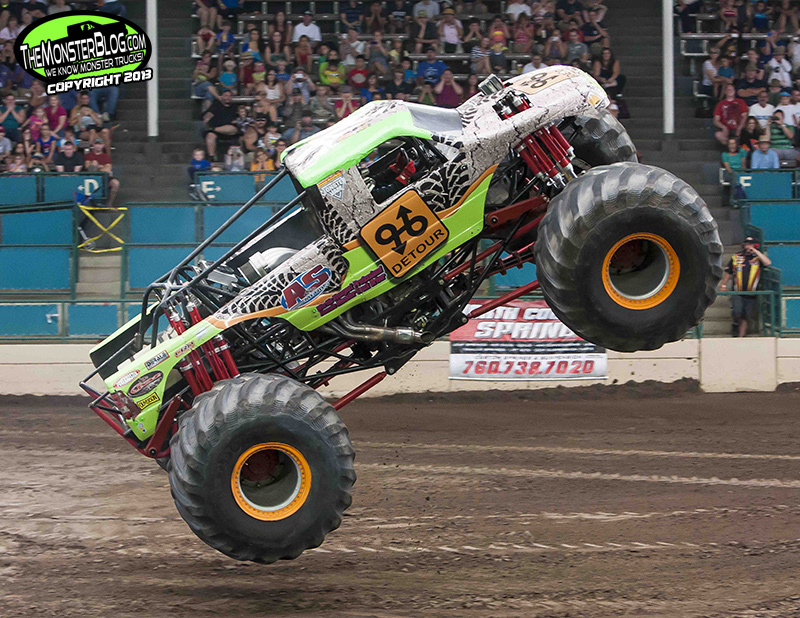 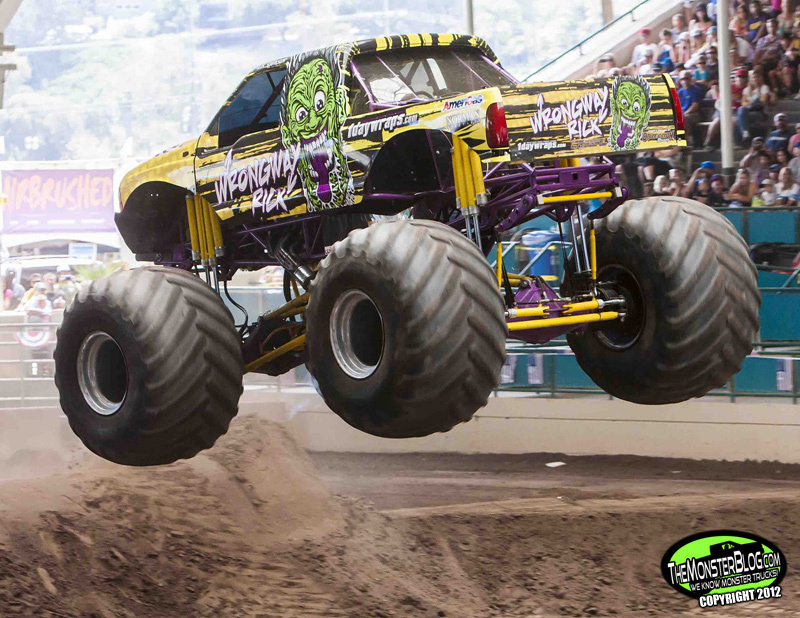 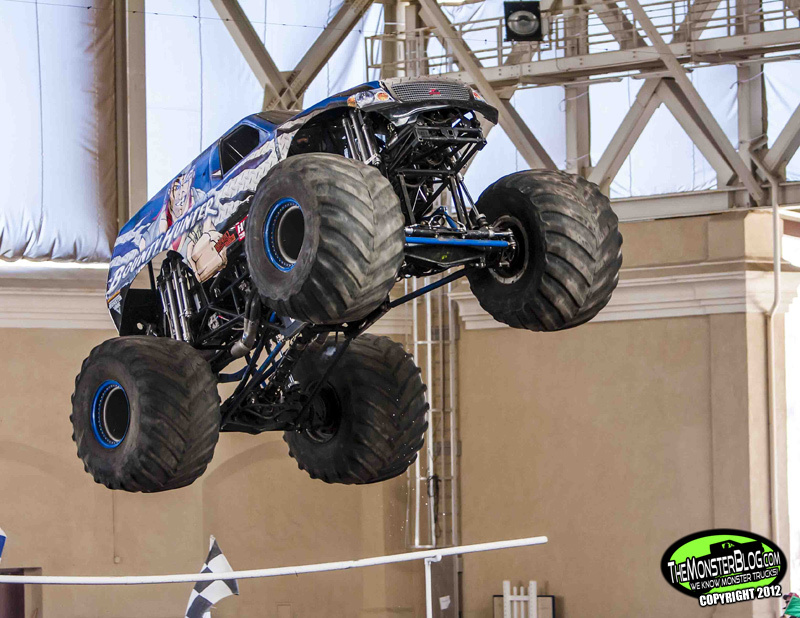 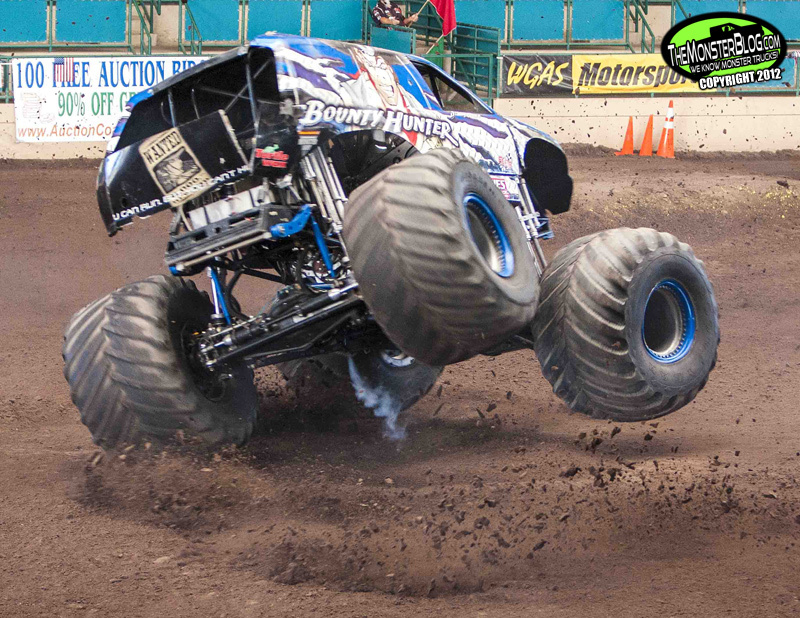 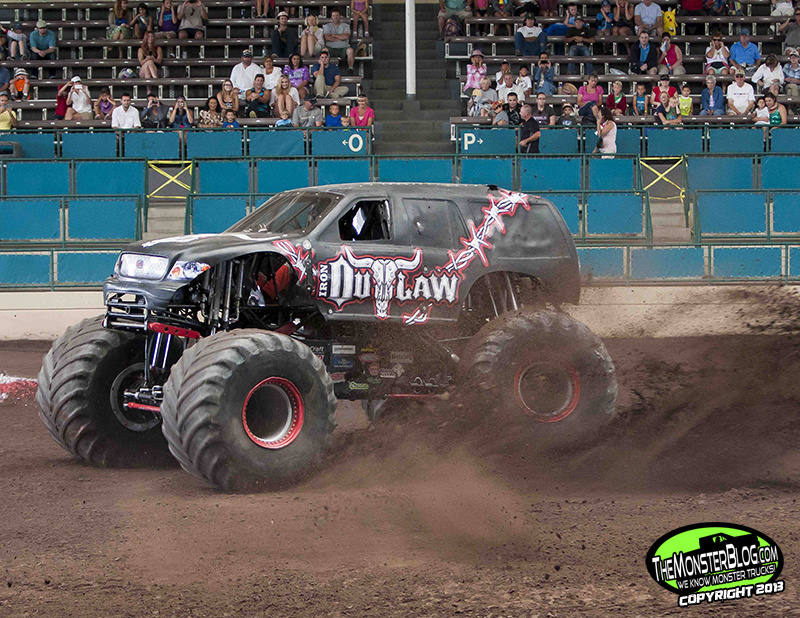 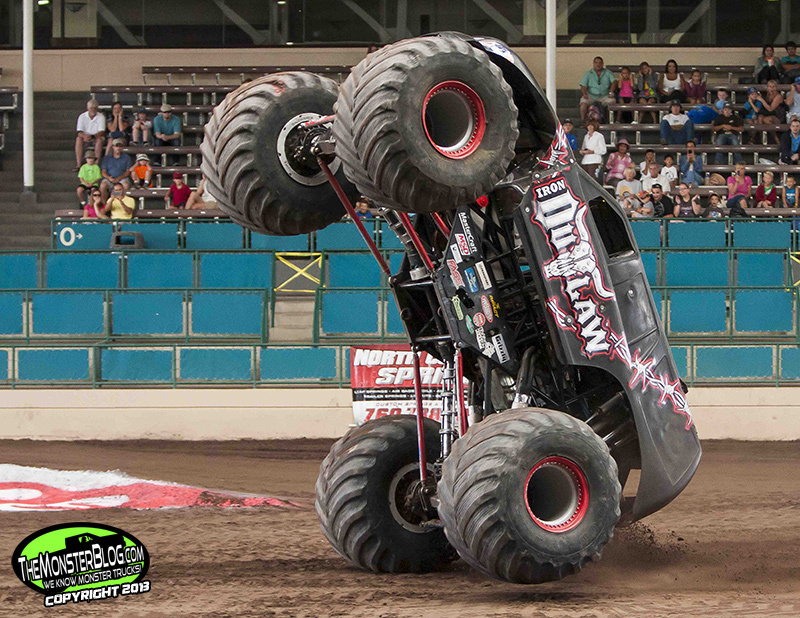 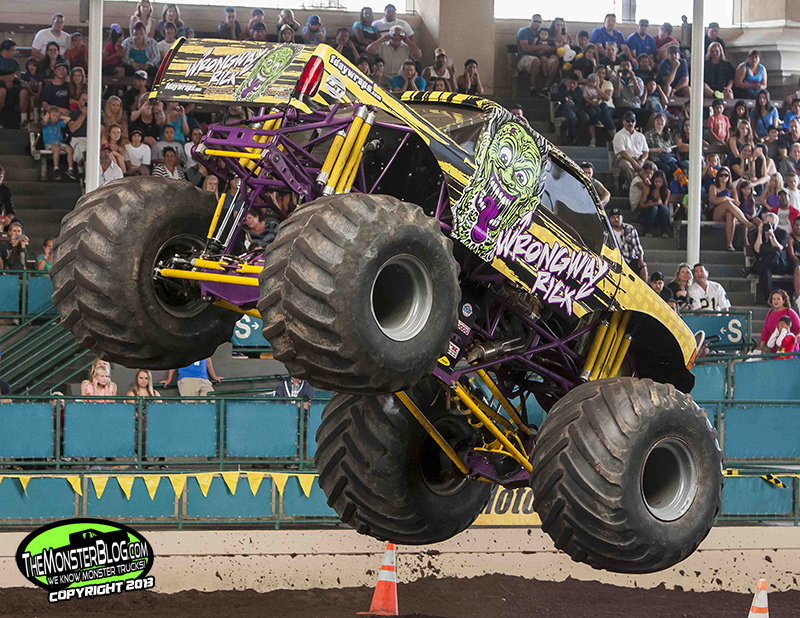 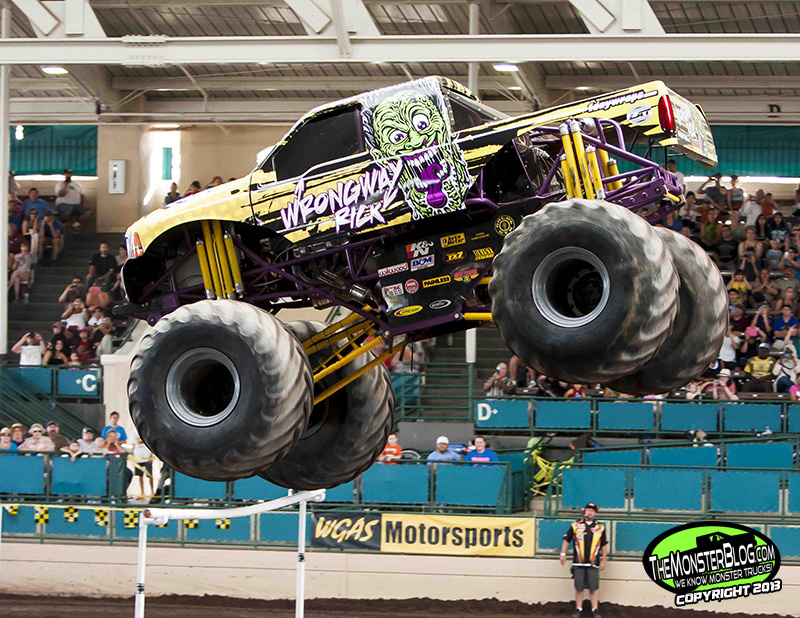 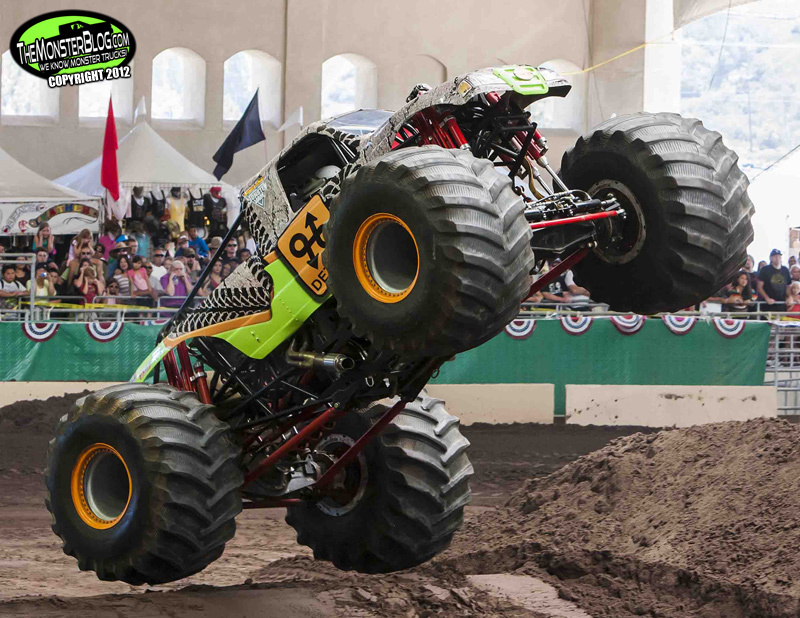 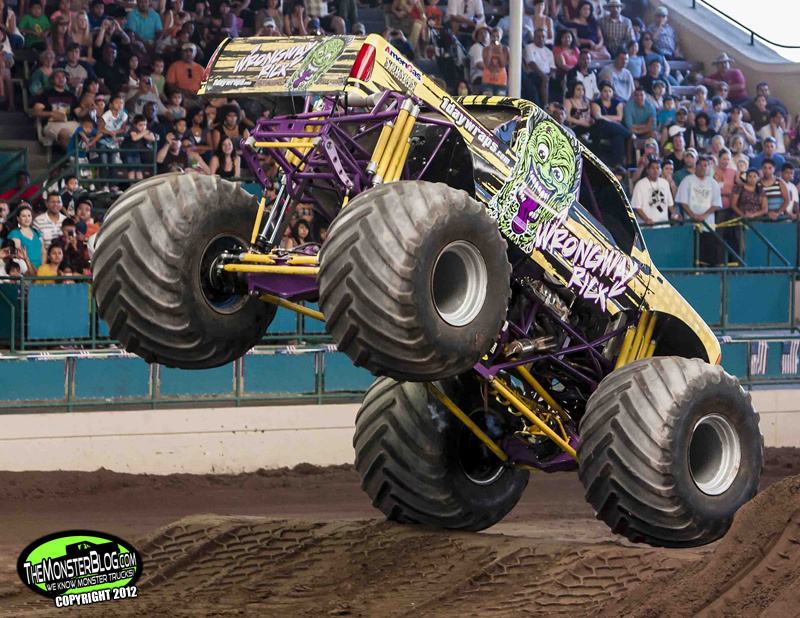 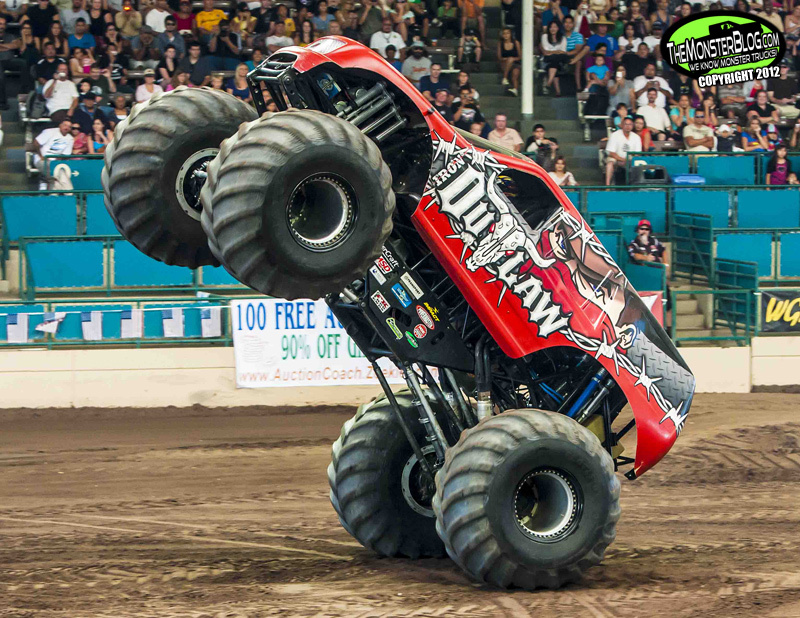 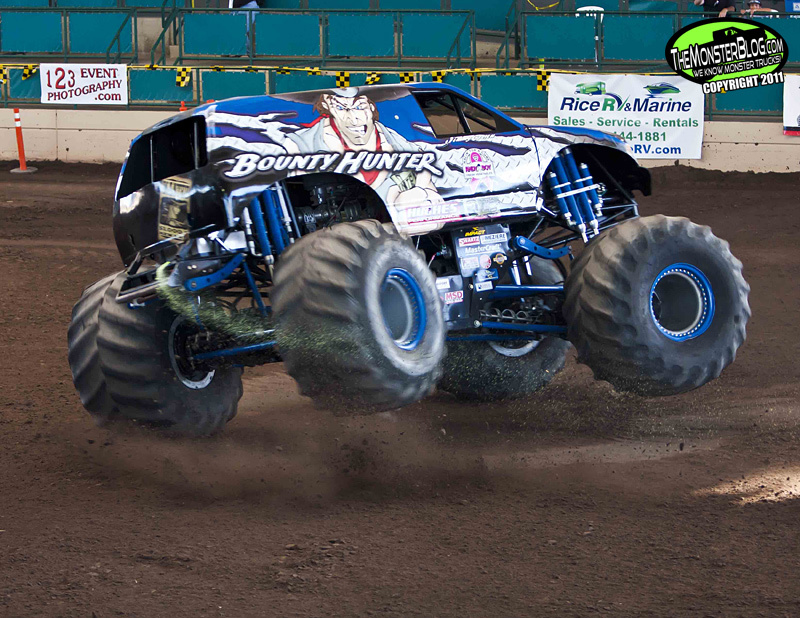 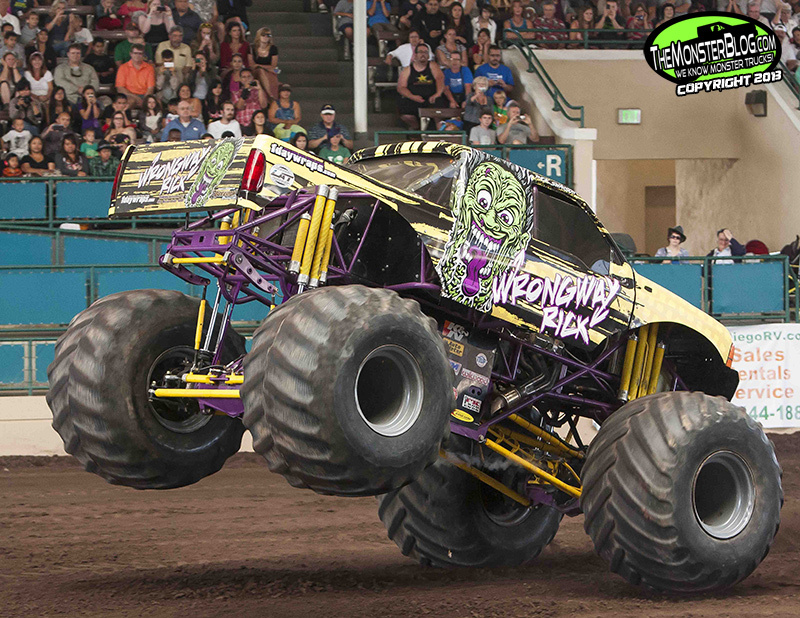 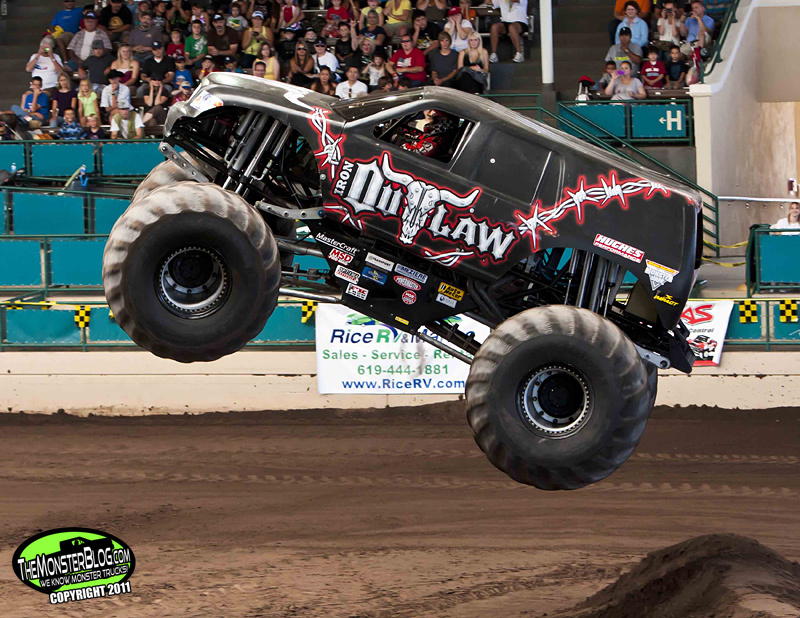 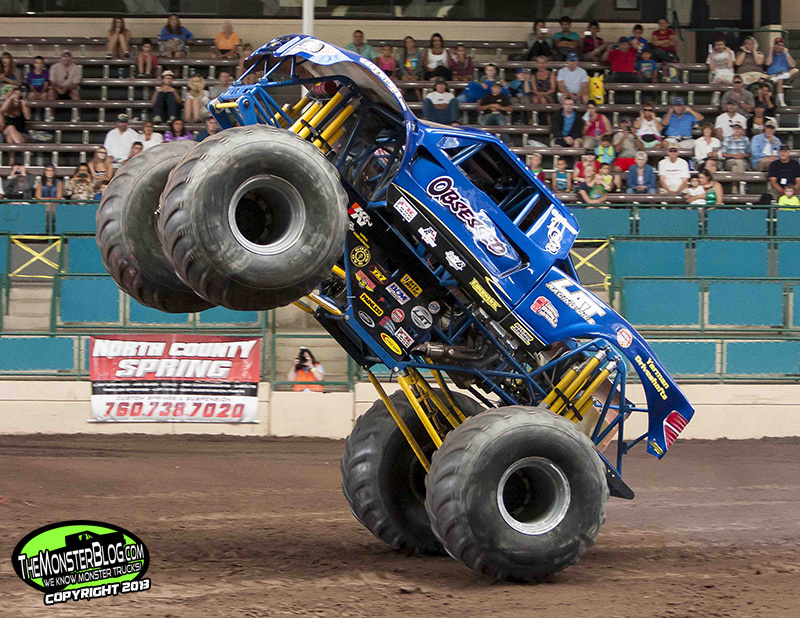 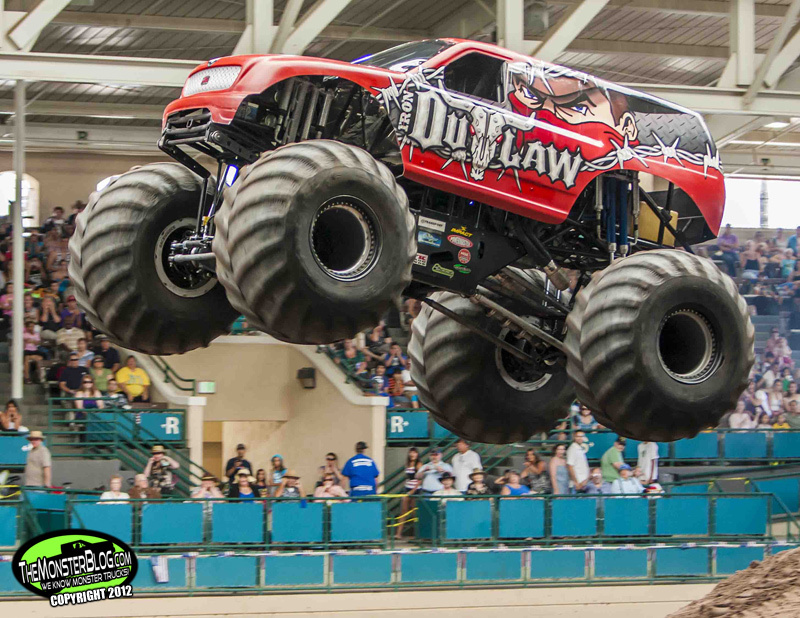 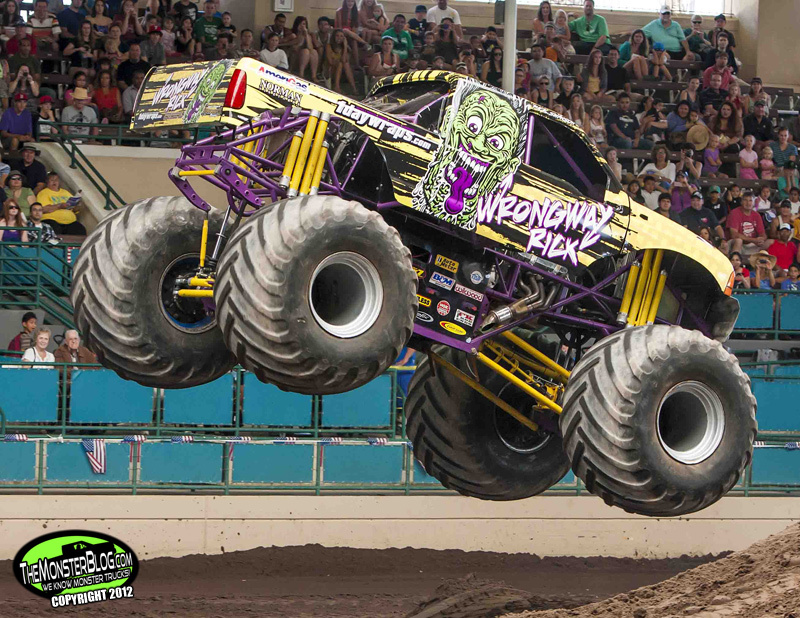 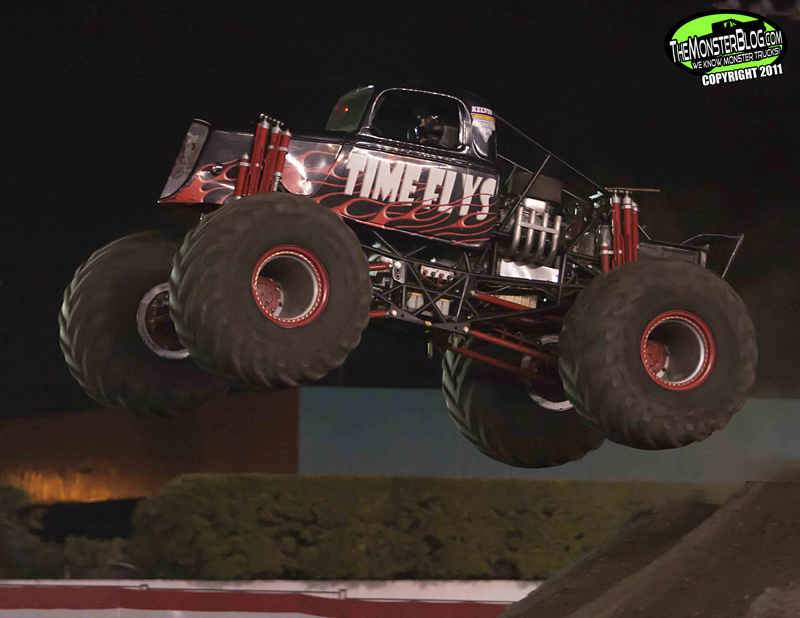 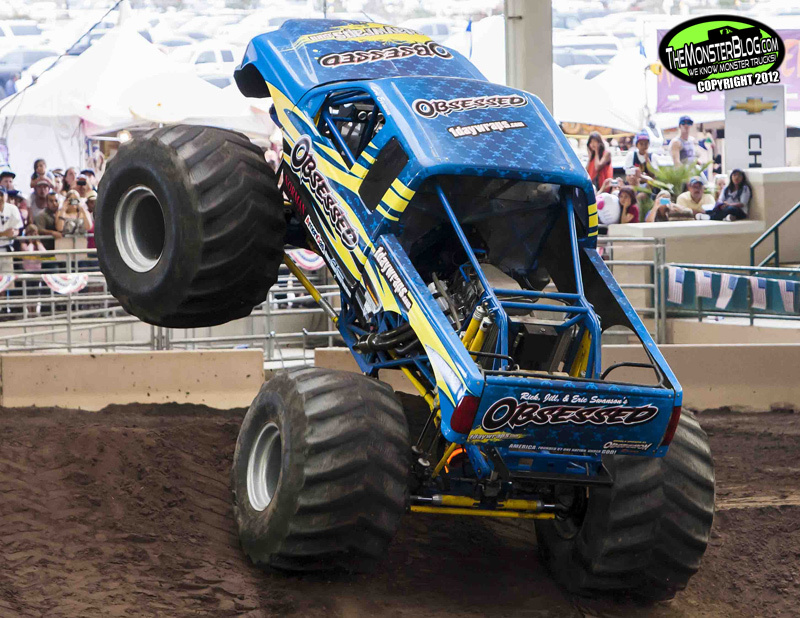 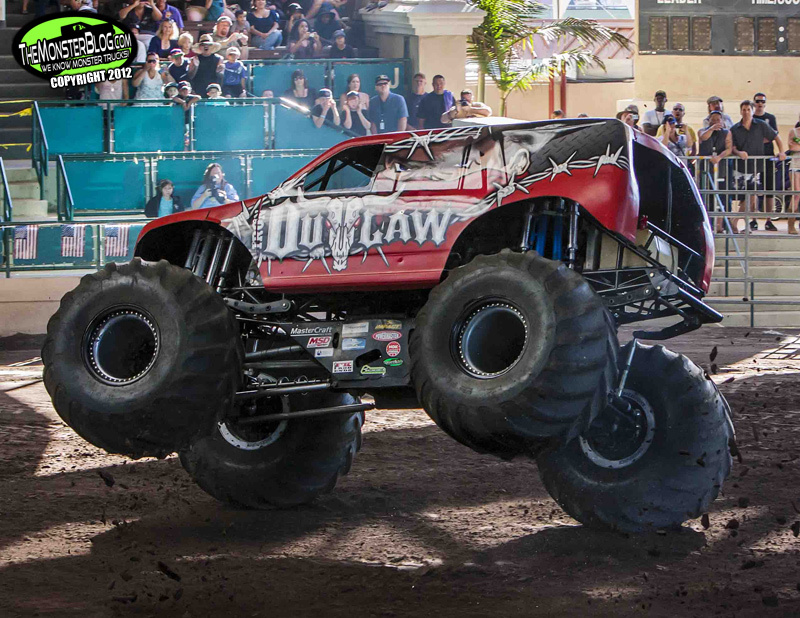 (Watsonville, CA) Living the Dream Racing and their Time Flys Monster Truck are Smashing the Shortage and bringing the awareness of the need of Organ donors to a show near you. 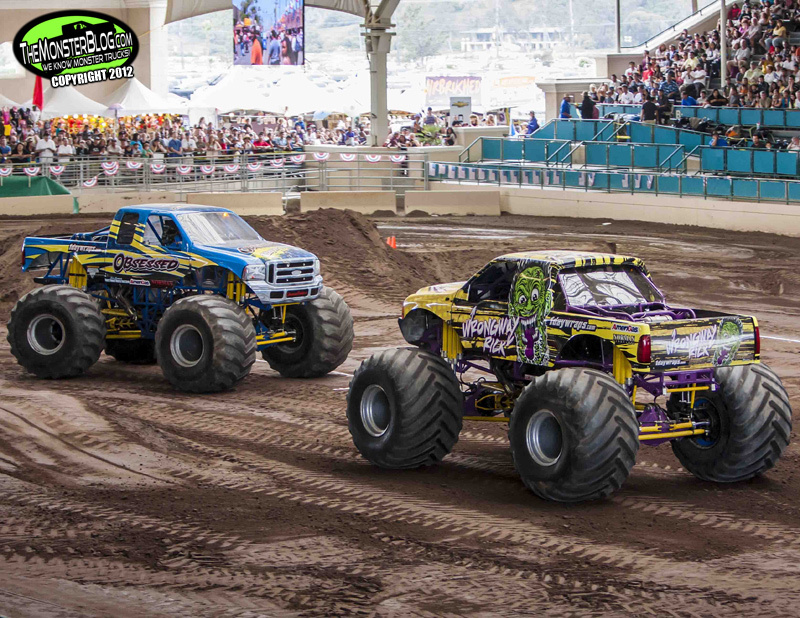 At the San Diego County Fair on July 2, the team had a great opportunity to meet 8 Organ recipients (3 heart, 2 kidney, 2 liver and 1 lung) and their families with Donate Life San Diego. 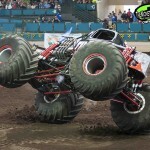 One of the heart recipients drove over 45 miles one way to be there. 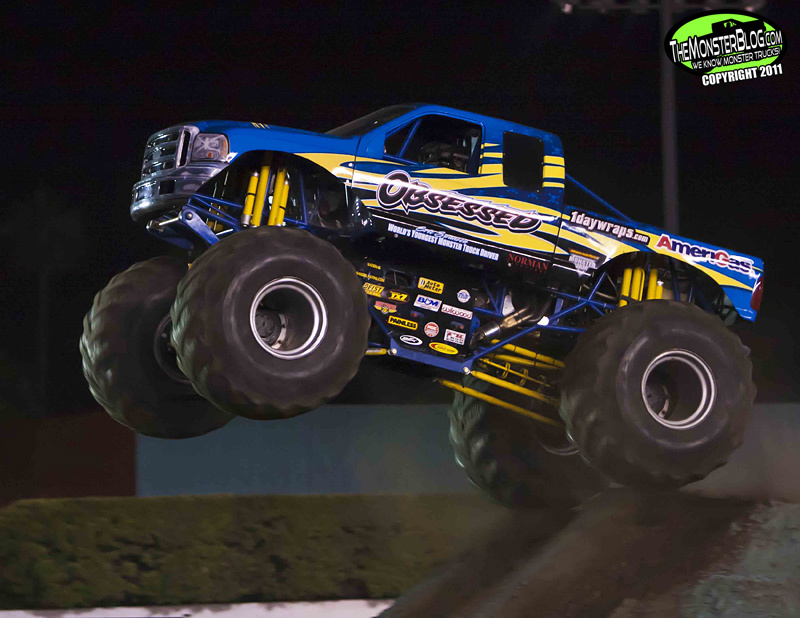 He was so amazed that he drove home to get his family to come back to the shows. 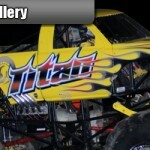 The reason behind the Donate Life flag on the truck is that crew member Patrick Carroll is facing a heart transplant in the future. 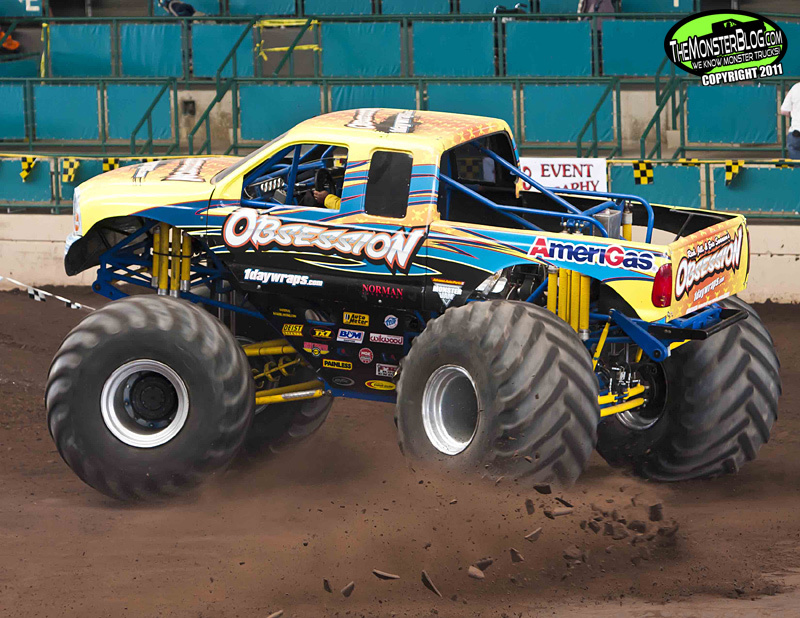 He approached Kelvin and talked to him about running a flag on the truck to bring awareness of the need of Organ Donors. 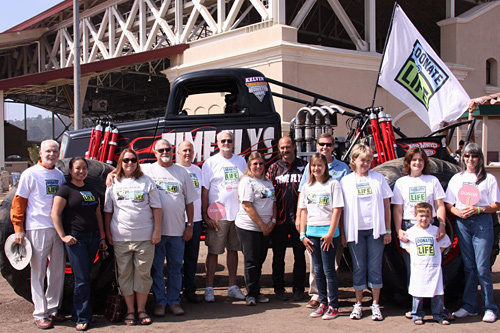 Donate Life America assists in mobilizing the transplant community to educate the American public on the need for organ, eye and tissue donation and motivating the public to make an actionable donor designation. 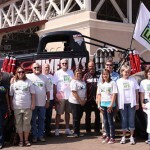 For more information, please visit www.DonateLife.net to find out how to sign up in your state.